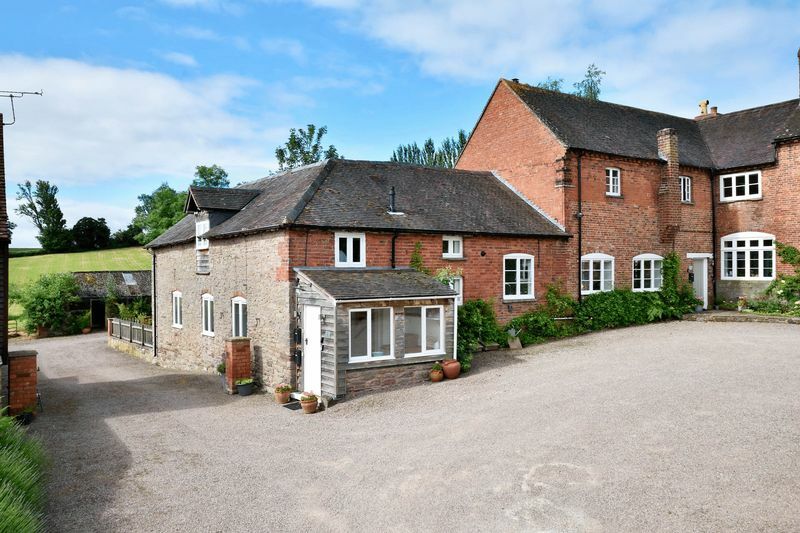 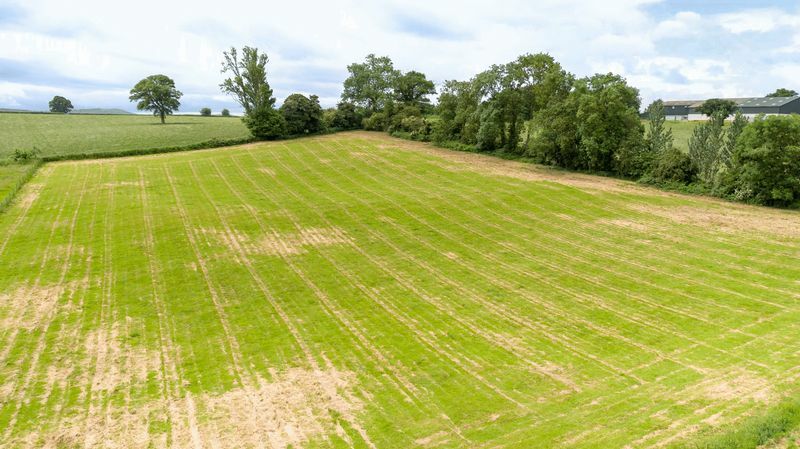 A Gorgeous Georgian 5 Bedroom Farmhouse with Adjoining Annexe/Holiday Let, 2 Further Holiday Let Apartments, Planning Permission on the Cow Shed for a 4th, Set on 4.58 Acre Holding Ideal for Equestrian Pursuits. 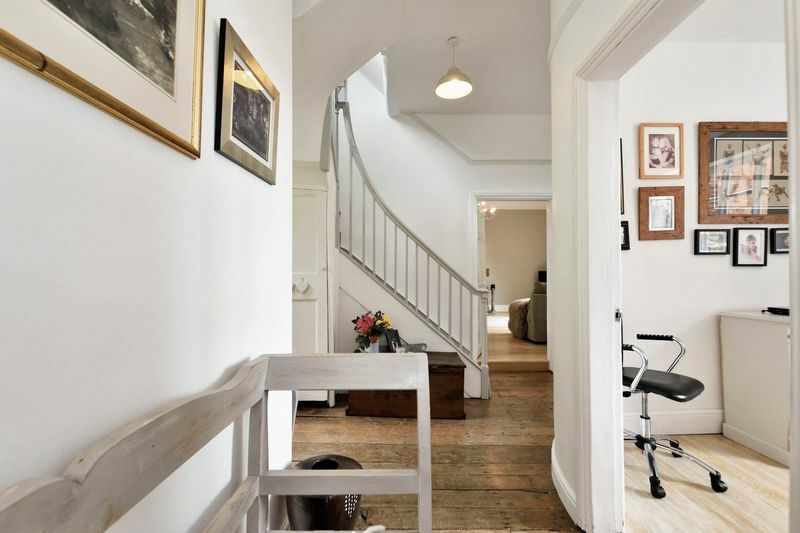 A graceful period property, stripped back to its bare bones and then masterfully and elegantly refurbished throughout, has created a stunning family home and rare opportunity to be able to satisfy myriad demands. 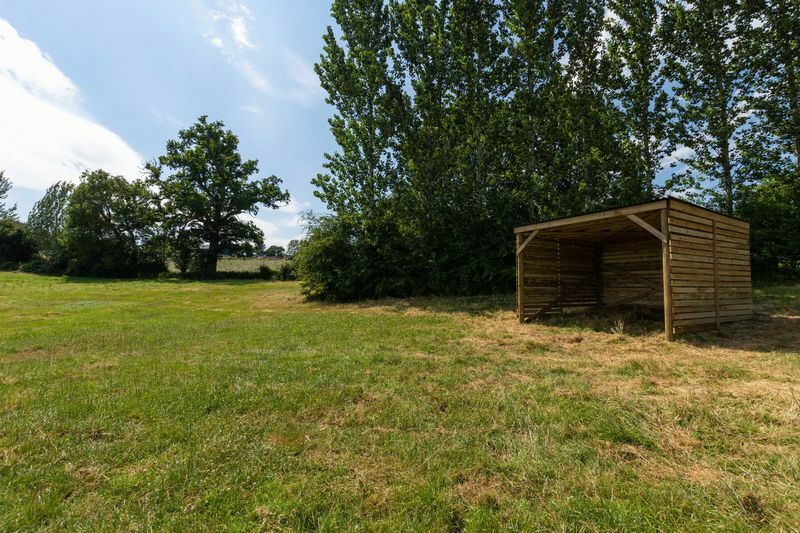 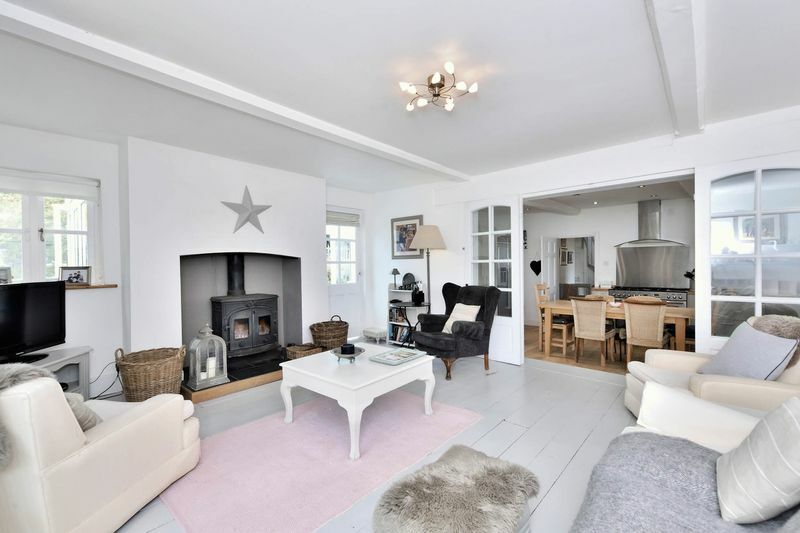 With multigenerational living immediately offered in the attached Annexe of ‘Middle House’ or contributing as a third Holiday Let to a year-round income of approx. 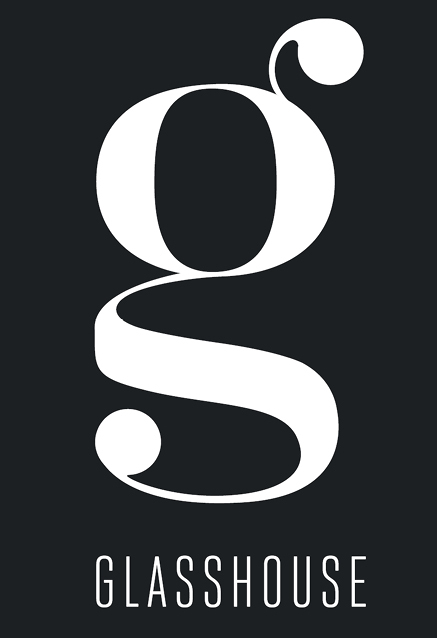 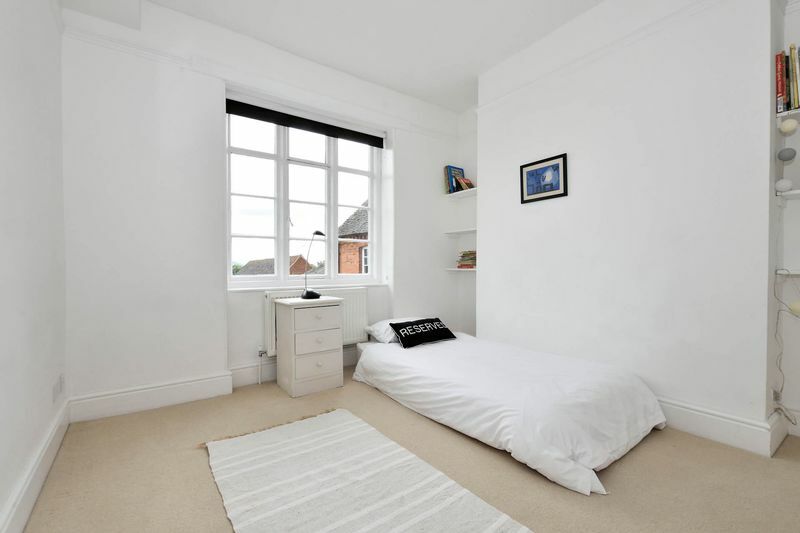 £1,000 per property per month. 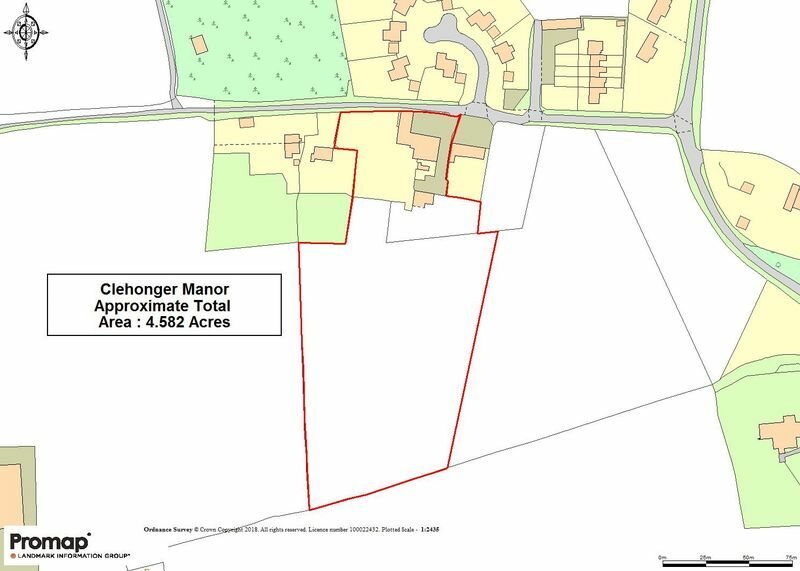 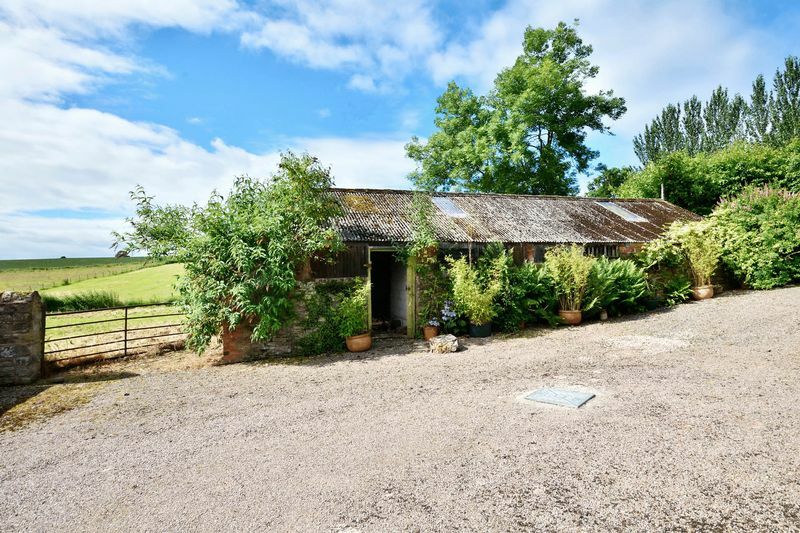 An income that could be further increased by development of the Cow Shed with its approved planning permission. 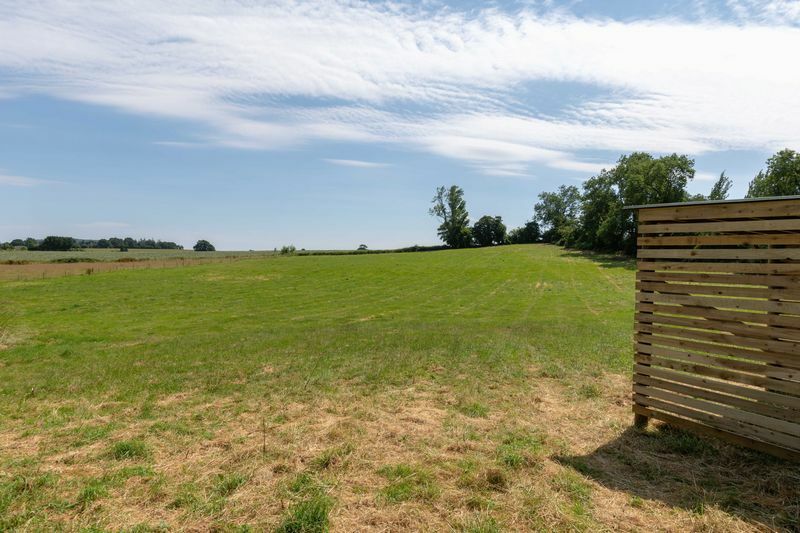 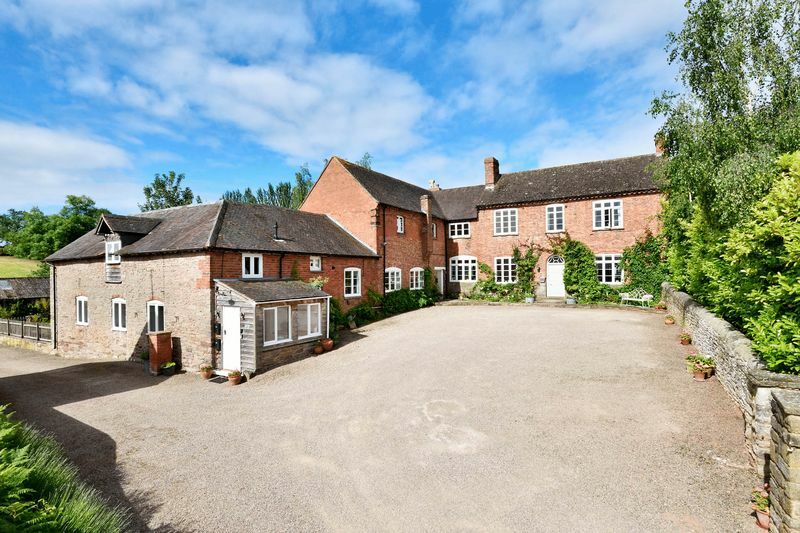 Or by exploring its potential by converting it into a modern Stable block for Equestrian pursuits. 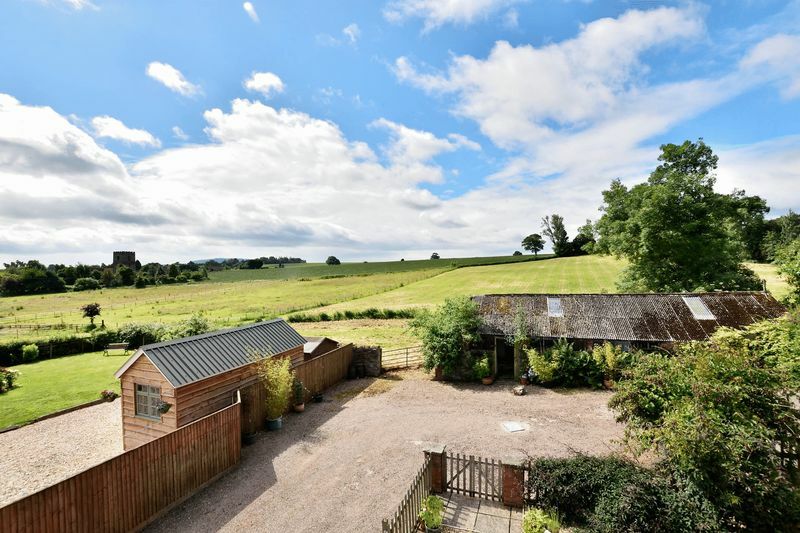 Enjoying a vibrant village location in Old Clehonger, the Farmhouse benefits from lovely views to the 13th Century church and sweeping vistas of open countryside. 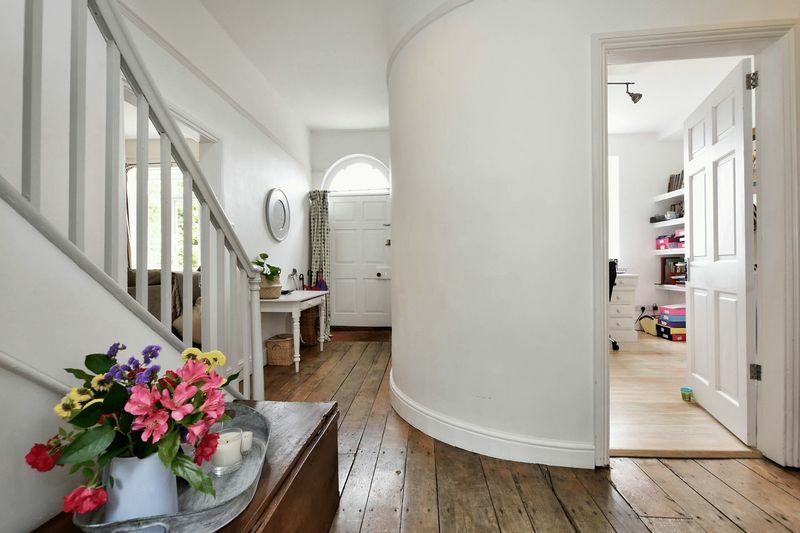 Farmhouse Entrance Hall – Beneath the original fan window with classic decorative tracery, the Front Door opens into the Entrance Hall with its original wood flooring, now concealing underfloor heating that runs throughout much of the ground floor. 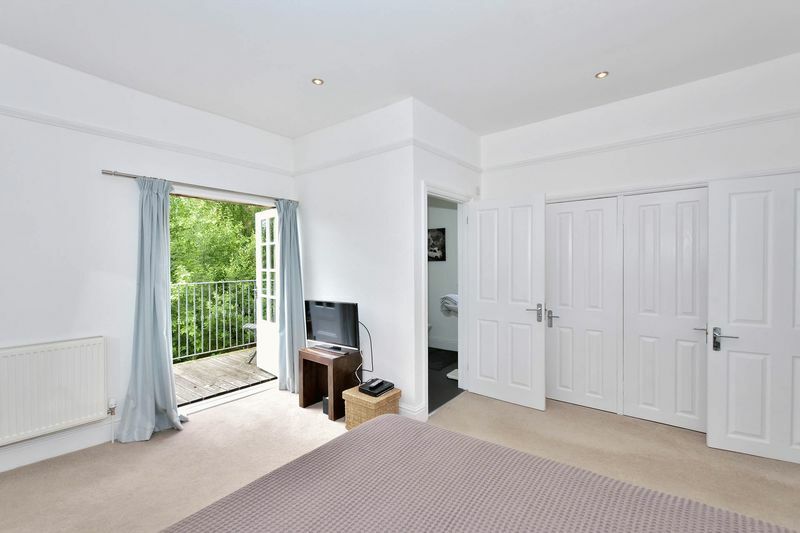 There is a useful Under-stairs Cupboard and a half-glazed External Door to the rear leading out into the gardens. 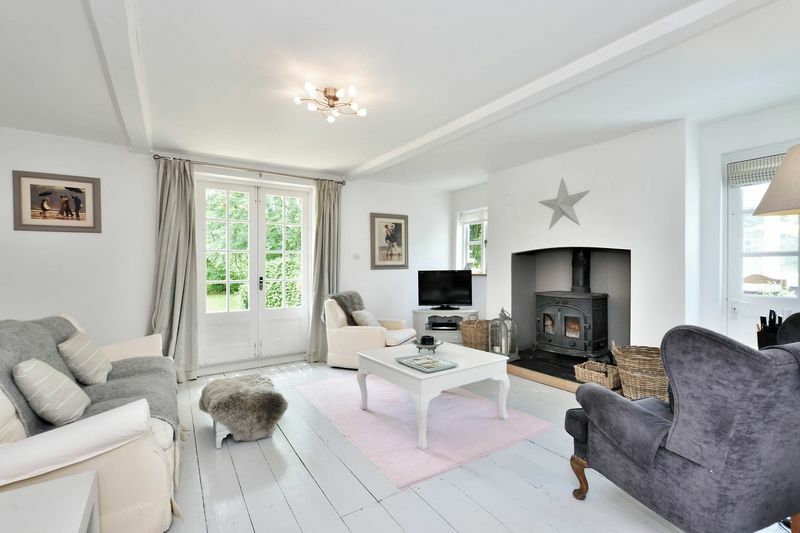 Sitting Room – Featuring an open fireplace with exposed stone and timber beam lintel, the expansive Sitting Room is flooded with light from an original casement window with views across the stone-walled front Courtyard. 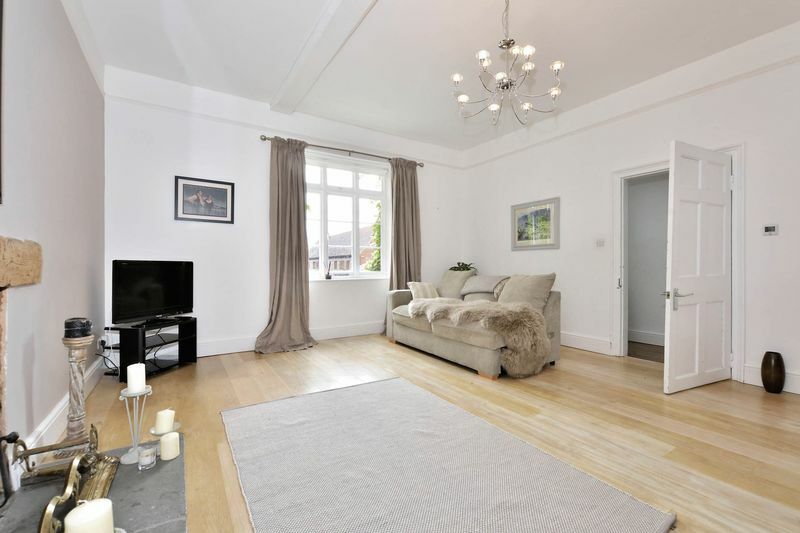 While the underfloor heating lies below honey-hued engineered hardwood flooring. 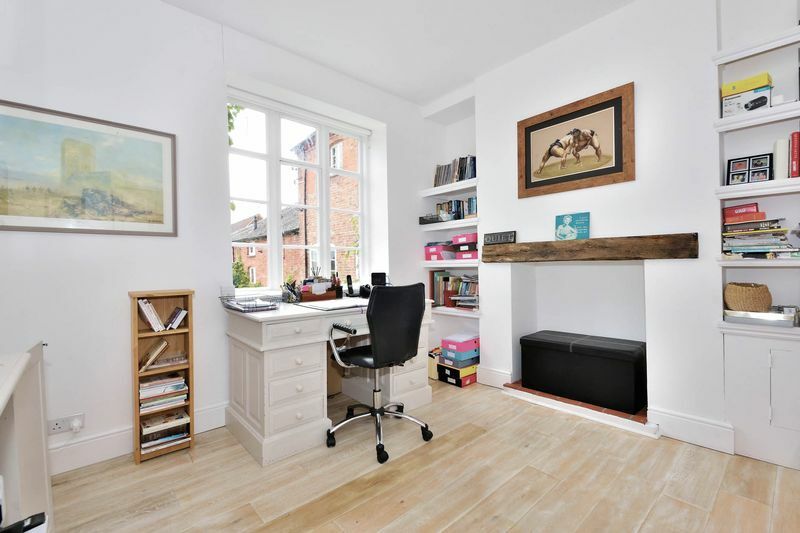 Home Office – The Home Office with window to the Courtyard and engineered hardwood flooring offers a malleable space as perhaps a formal Dining Room, grand Study or Library with open shelves to either side of the alcove fireplace. 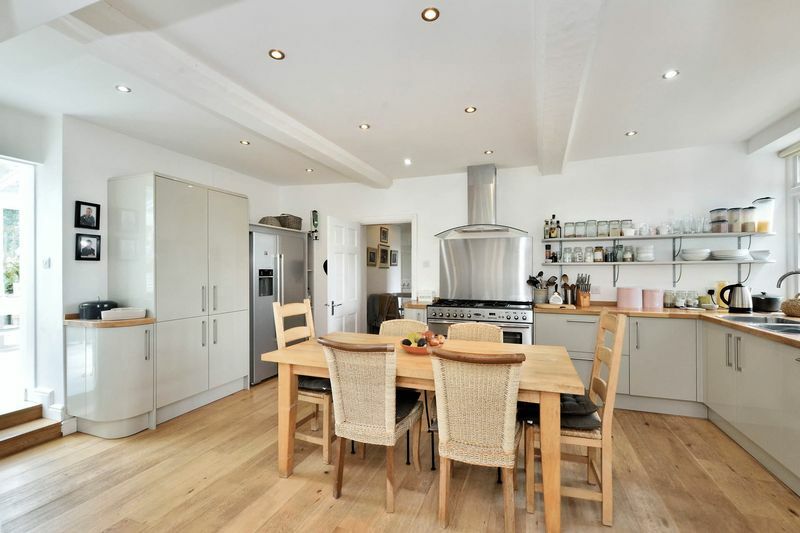 Kitchen/Diner – The large country Kitchen with ample space for family dining is fully-fitted in high-gloss units warmed by solid wood countertops and provides an array of storage with pan drawers and full-height, double, Larder Cupboard. 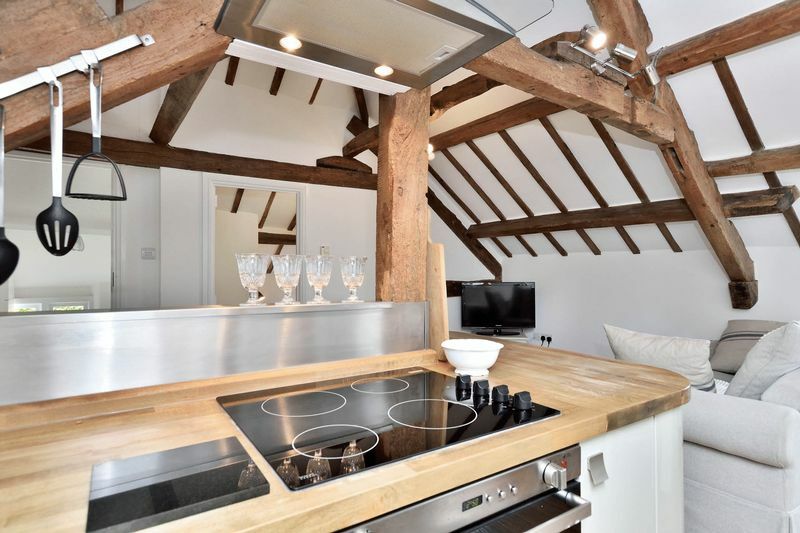 Also featured are large Rangemaster cooker with 5 burner gas hob and side warming plate, stainless steel splashback with hood above, integral US style fridge/freezer and integrated dishwasher. 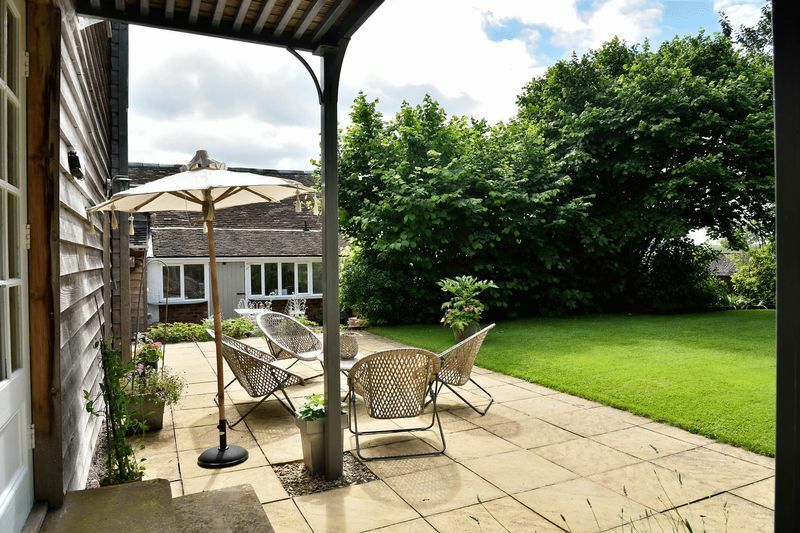 Twin stainless steel sinks sit beneath a double-glazed window overlooking the Courtyard, while a doorway opposite leads into the Garden Room. 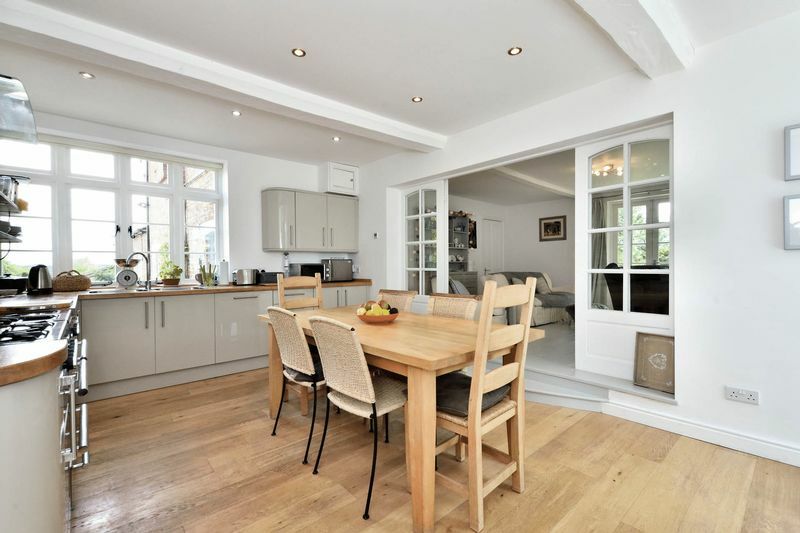 Family Room – Two steps lead up from the Kitchen beyond twin folding glazed doors into the Family Room. 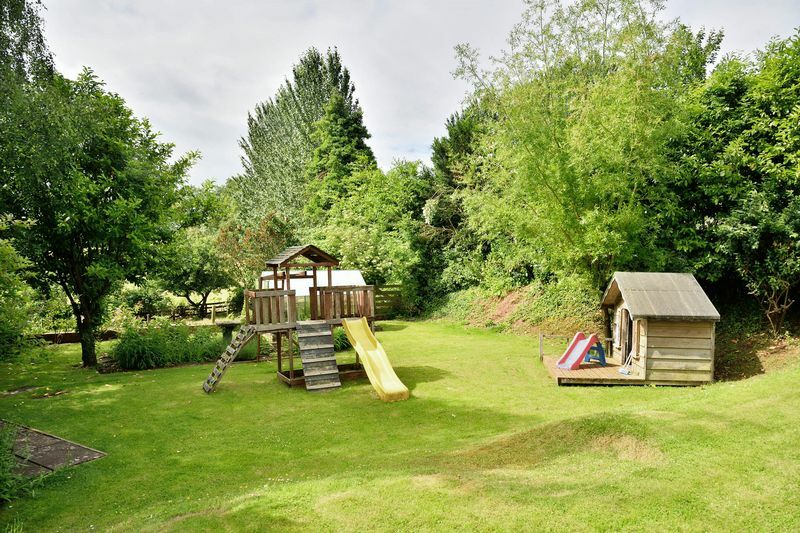 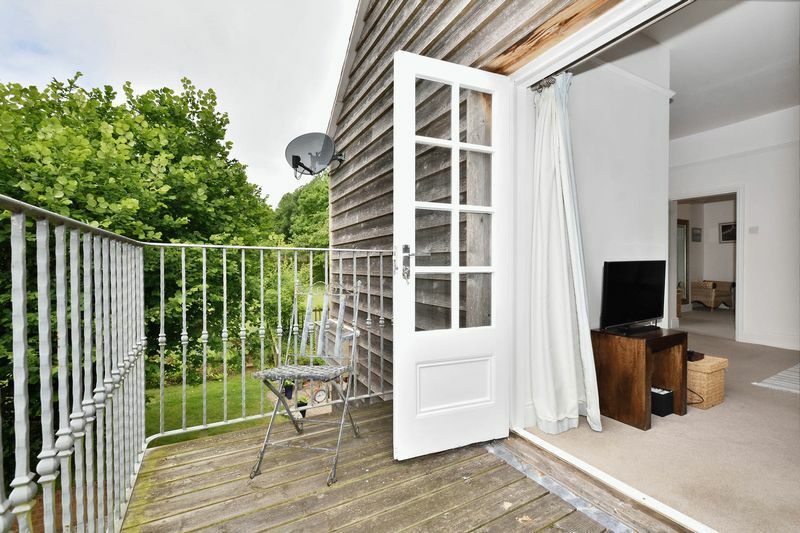 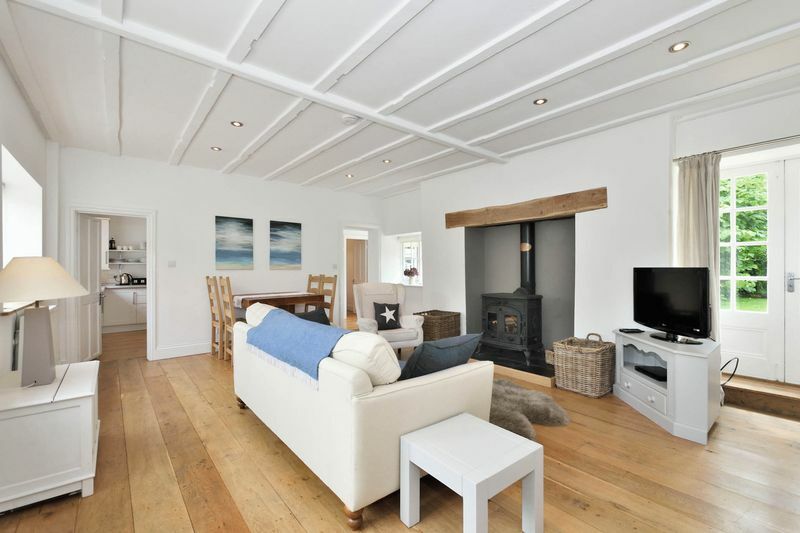 Offering a great hub for family life made cosy by a large Woodburner, the inviting space has both French doors leading out onto the paved side patio and also a single French door opening into the Garden Room. 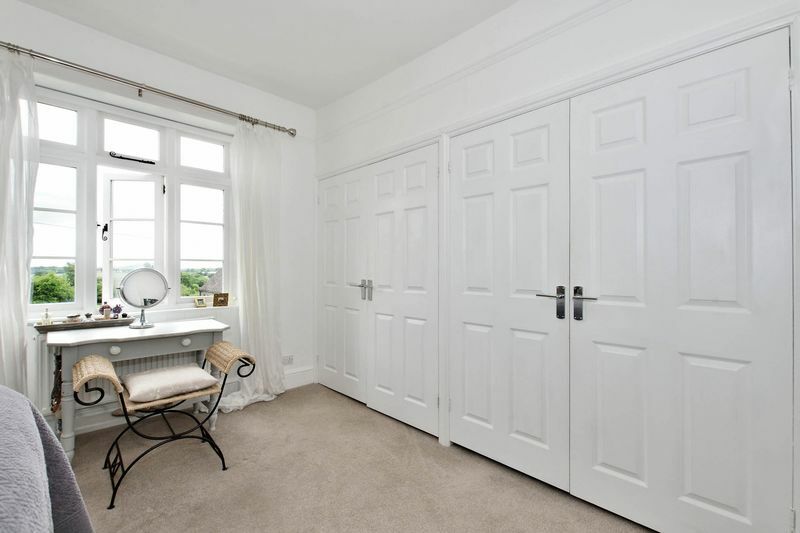 To the far side of the room an original door conceals direct access into Middle House, currently sound-proofed and boarded yet readily reconnected. 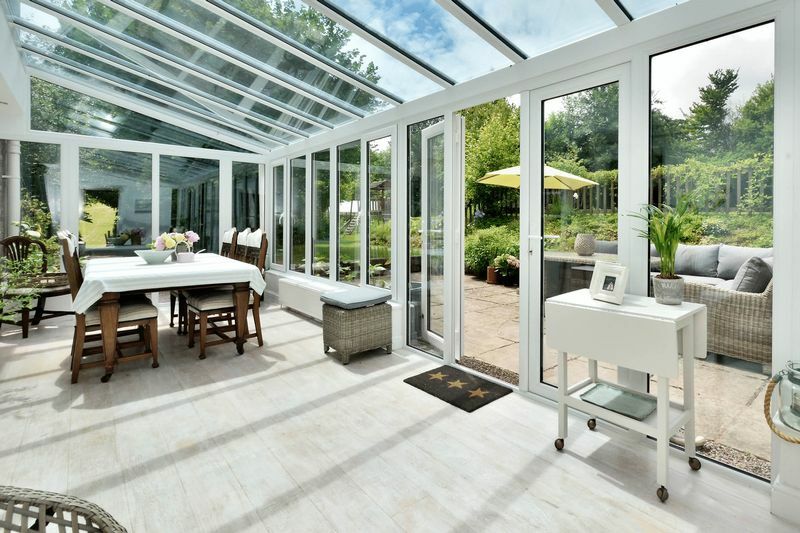 Garden/Dining Room – The modern Garden Room extension with bleached-effect white wood flooring and full glazing offers a delightful modern Dining Room framing views across the private rear gardens. 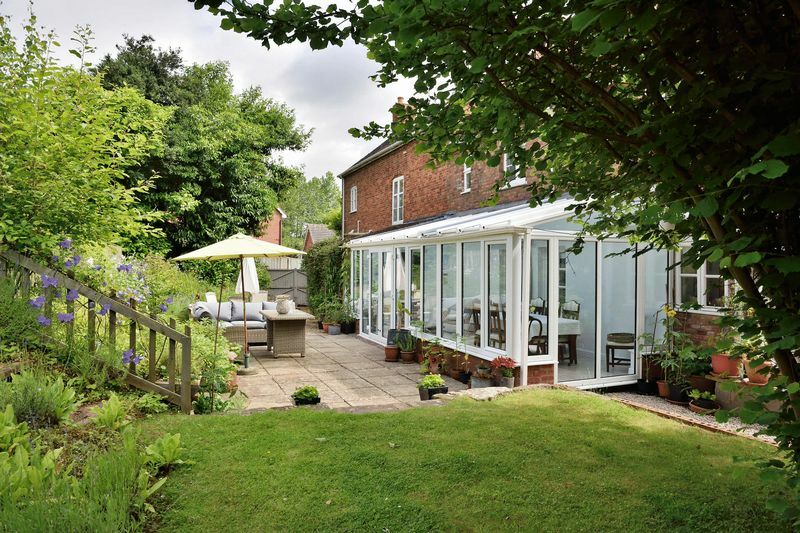 French doors lead directly out onto the wide paved patio, ideal for Outdoor Dining and bordered by a floral bank before the upper lawn bounded by mature trees. 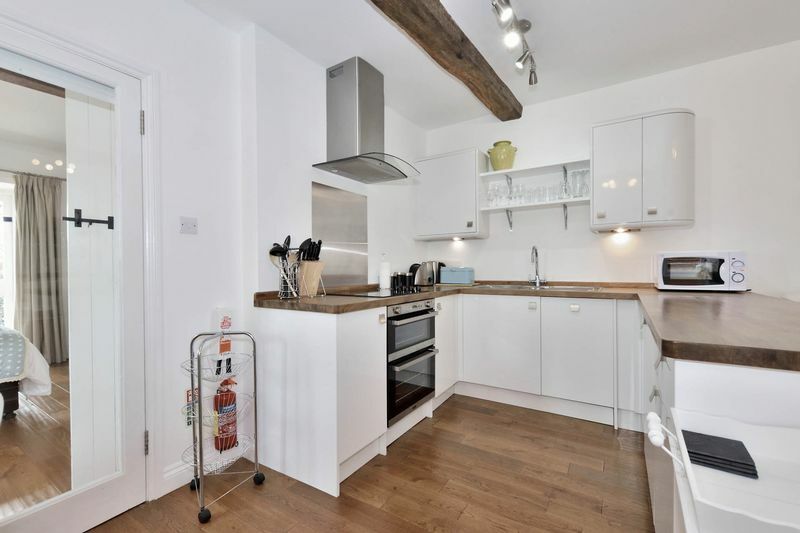 Utility – To the side opens the Utility Room with space for washer and dryer to either side of a fitted unit with bleached wood countertop above and stainless sink with integral drainer. 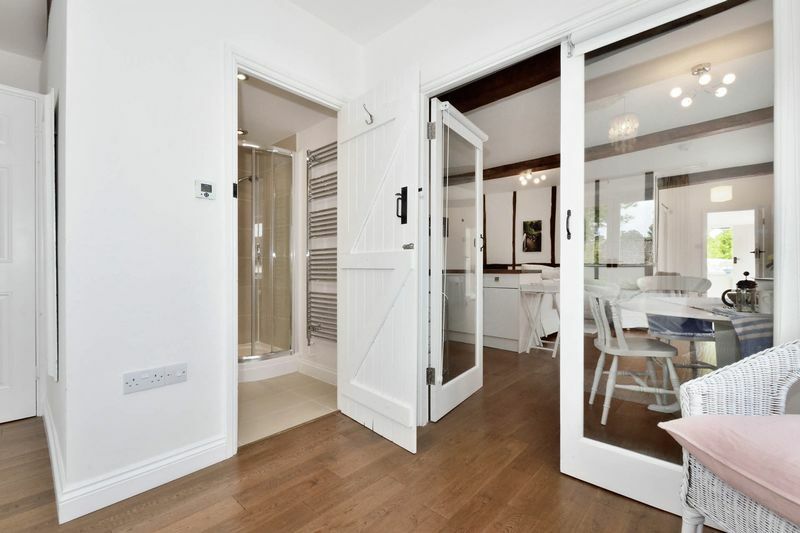 An External half-glazed Door leads out into the rear gardens. 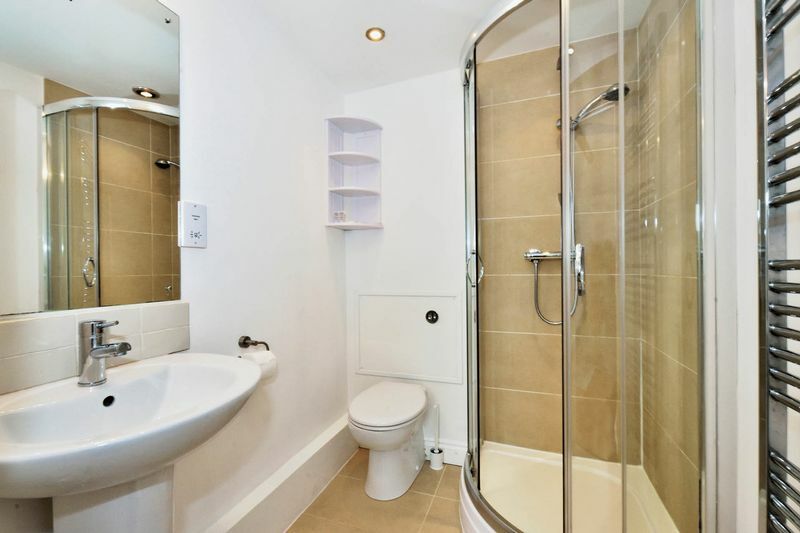 Downstairs Shower Room – Beyond the Utility with matching travertine tiling opens the modern Shower Room with shower cubicle, WC and pedestal basin. 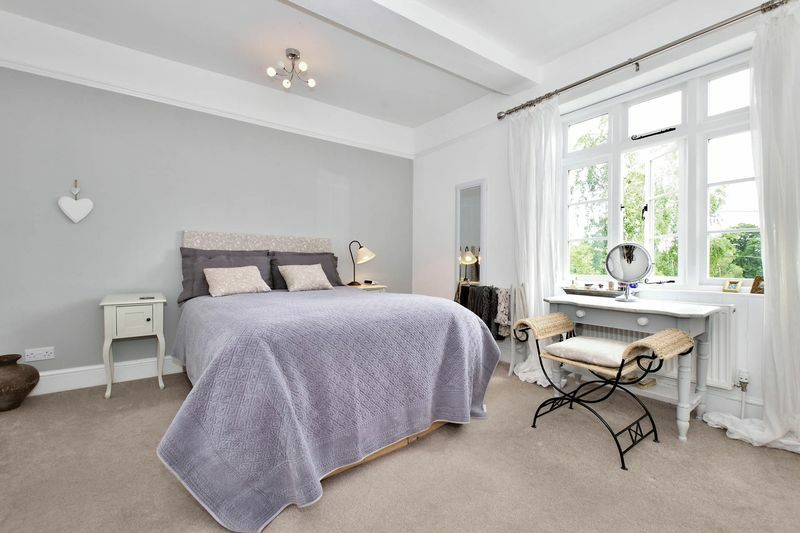 Master Bedroom – The spacious, carpeted Master Bedroom features twin built-in, double wardrobes, while French doors open onto a balcony with metal balustrade enjoying private views over the side gardens. 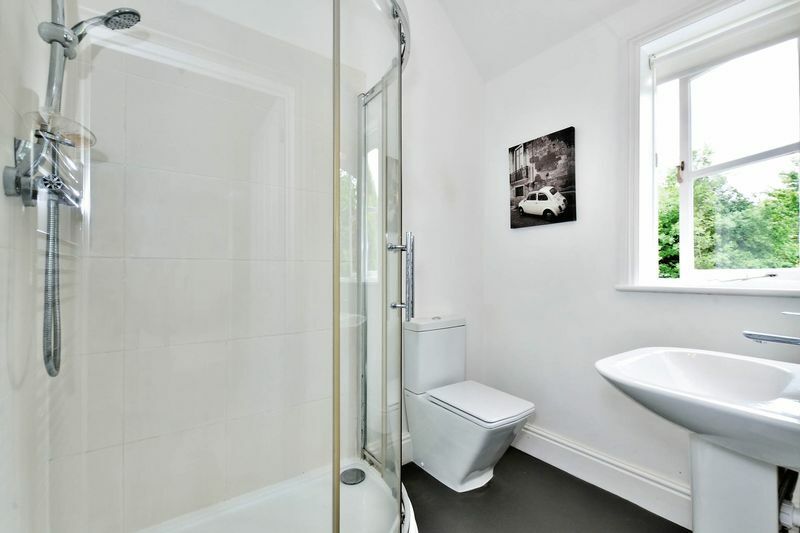 The Ensuite is completed with large shower cubicle, WC, pedestal basin and chrome heated towel rail. 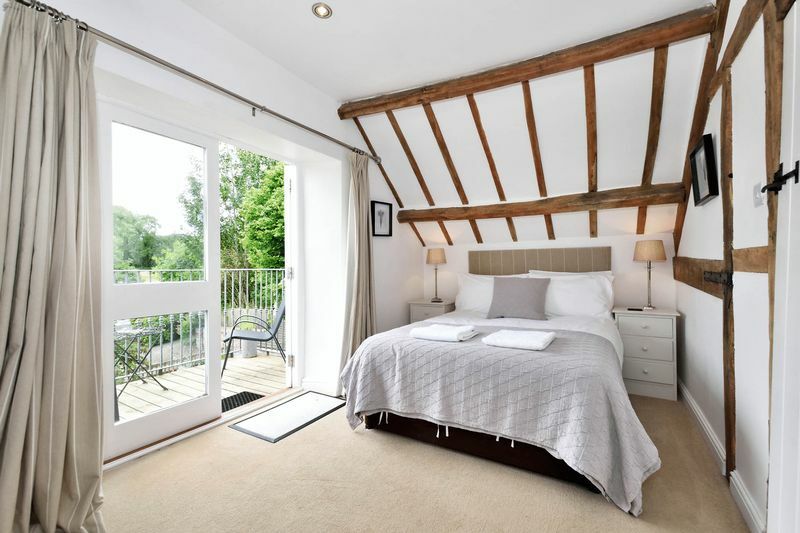 Bedroom Two – The spacious, carpeted Double Bedroom has twin built-in double wardrobes and a period-style, timber, double-glazed window with lovely views over the Courtyard, to the church and open countryside beyond. 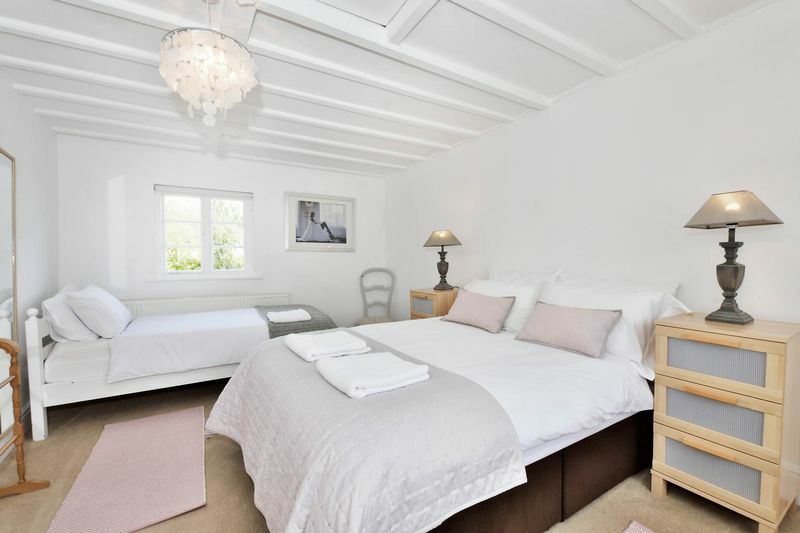 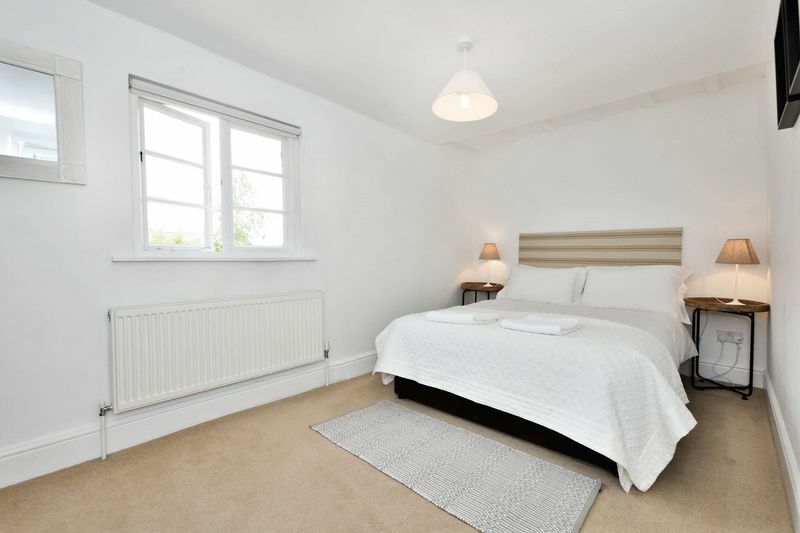 Bedroom Three – A spacious Double Bedroom with original window overlooks the Courtyard. 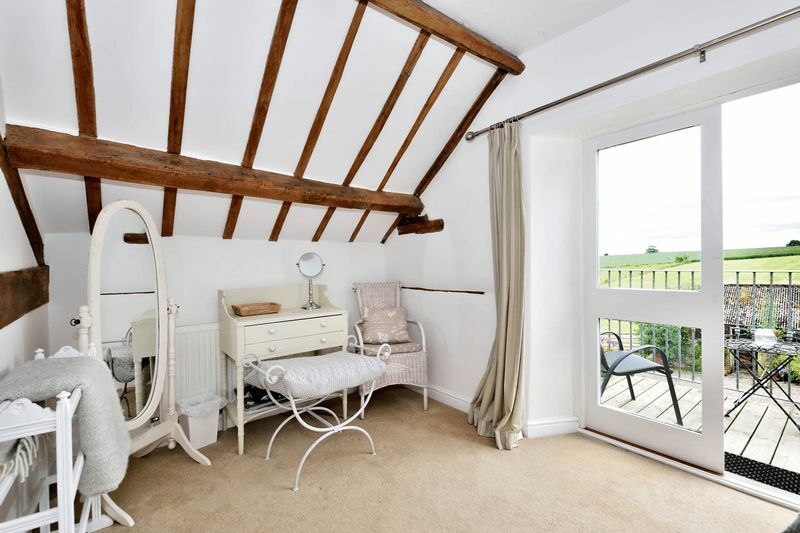 Bedroom Four – A carpeted Double with 3 fitted shelves to either side of the chimney breast and original window overlooking the Courtyard. 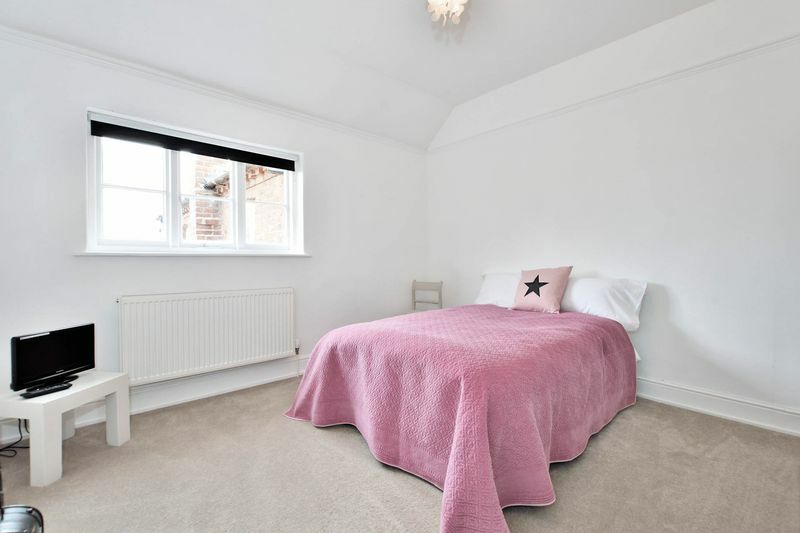 Bedroom Five – The last of the Bedrooms is a good-sized carpeted Single. 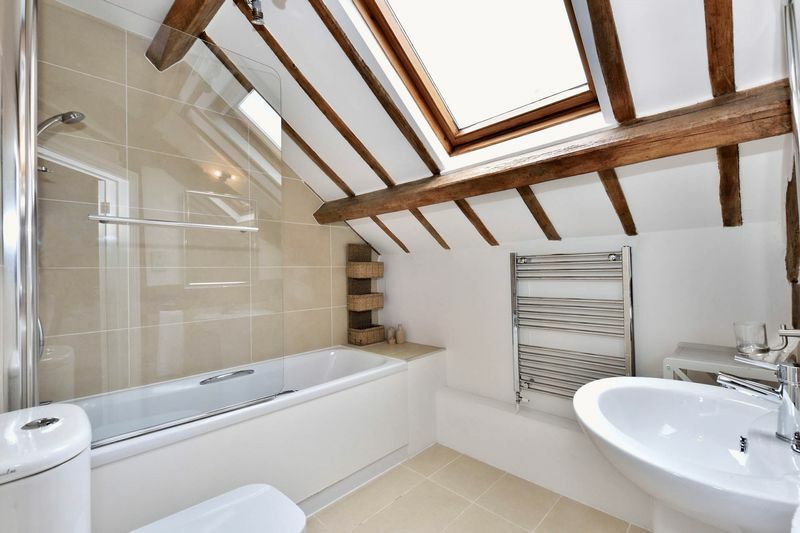 Family Bathroom – In modern giant, grey tiles the Bathroom features a full bath, separate walk-in shower cubicle, WC, pedestal basin and is completed by chrome heated towel rail. 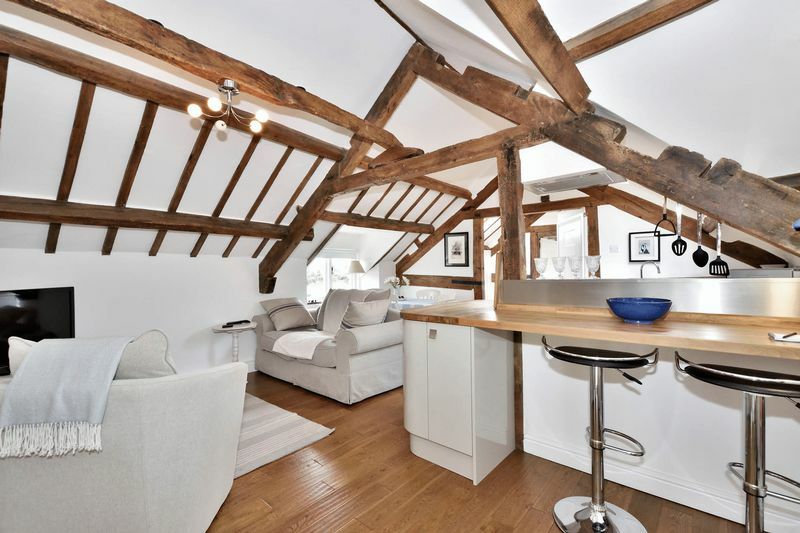 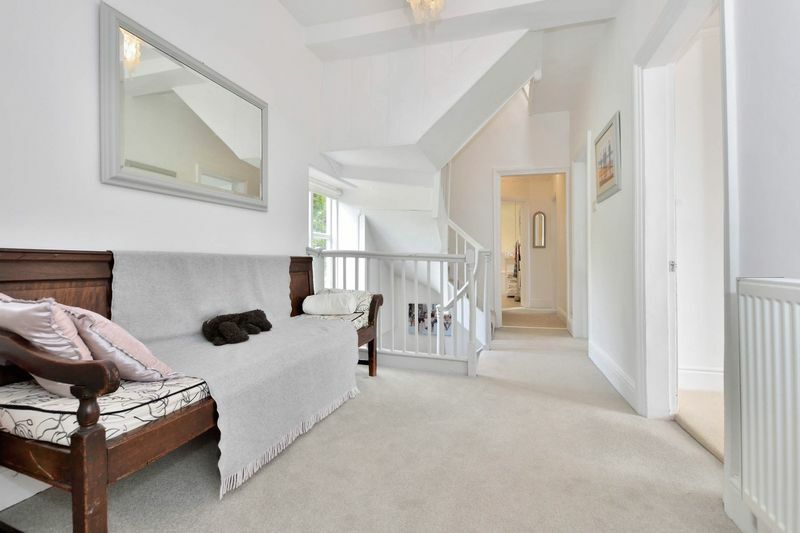 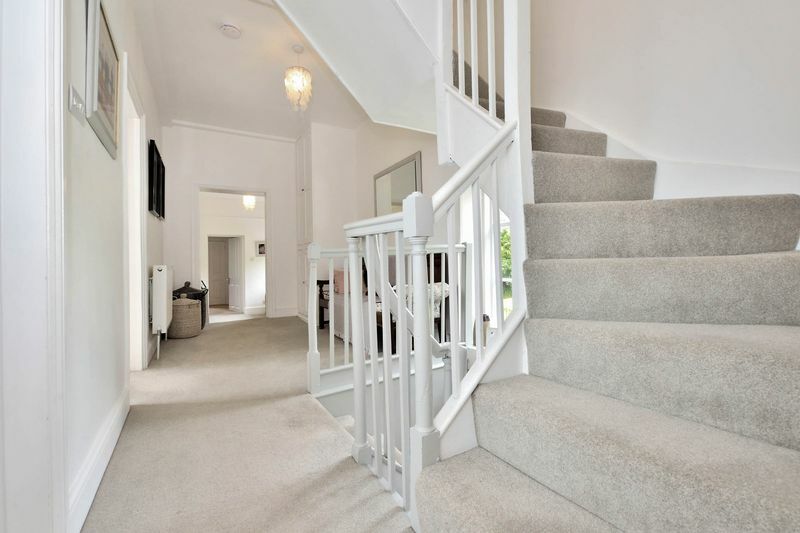 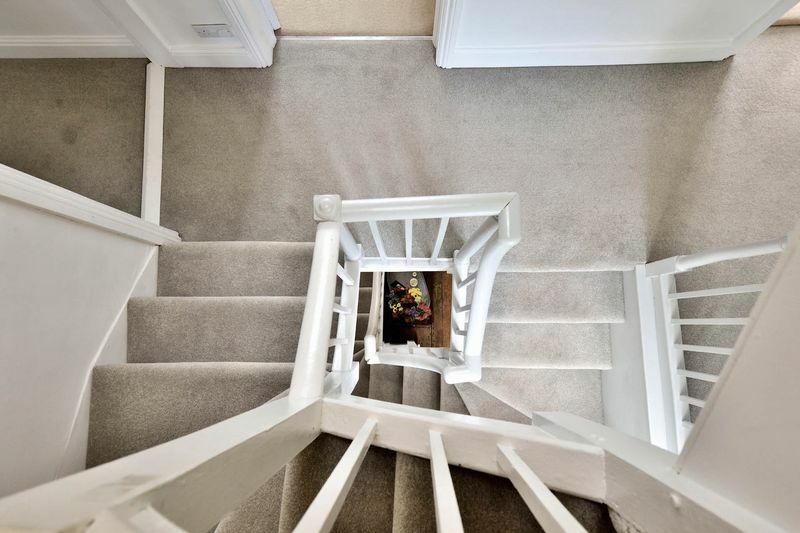 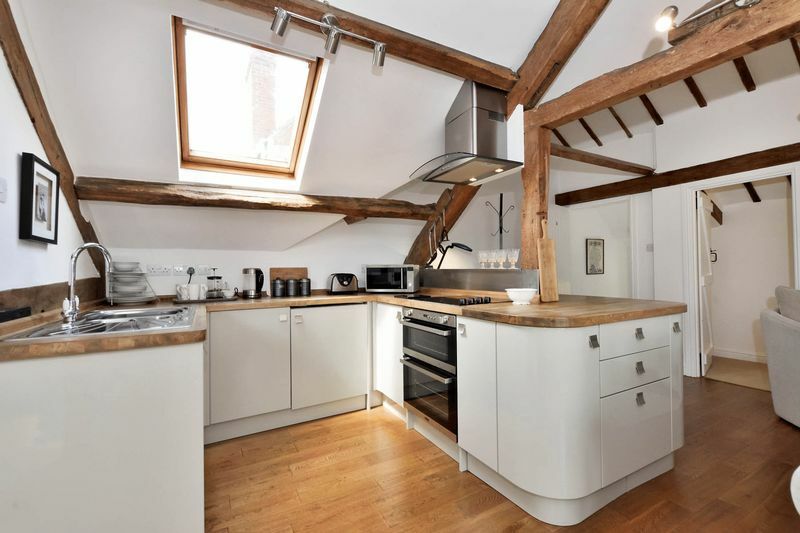 Loft Room – From the Landing with large Airing Cupboard, stairs climb up into the original Attic, now converted and carpeted to create a secluded and highly malleable space, with to the far end an open storage room. 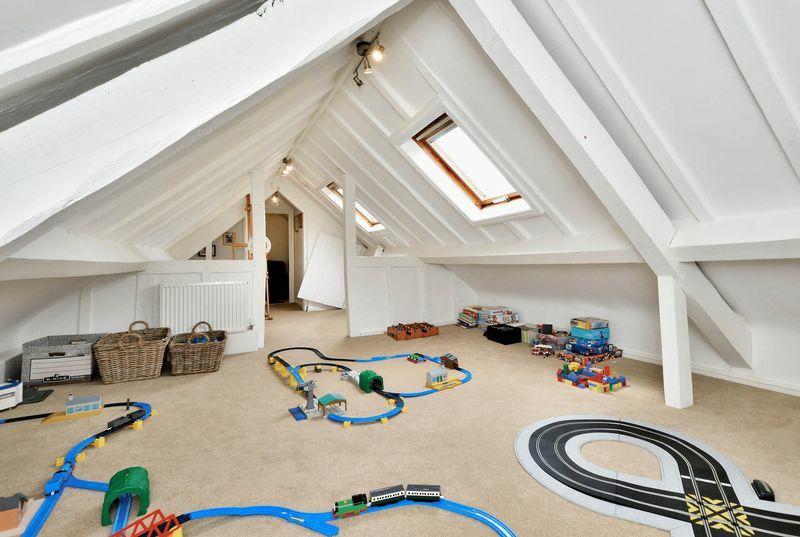 It offers an ideal Play Room for youngsters, for teenagers a rumpus room or for adults a hobby room or more private retreat. 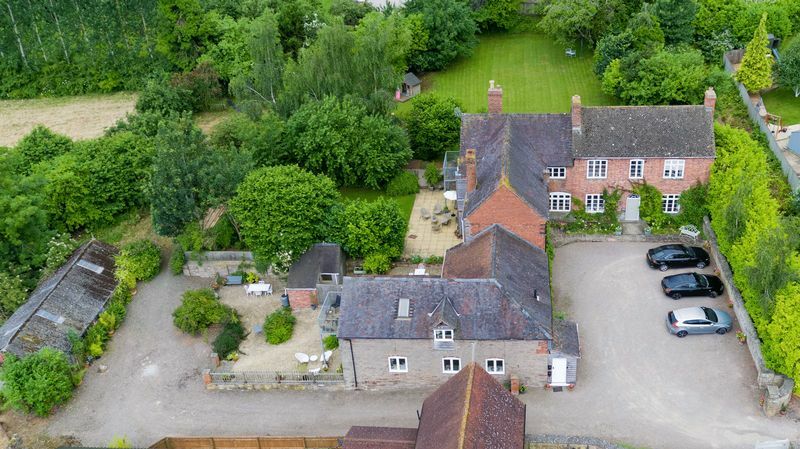 Cellar – The traditional and expansive Cellar, home to the Worcester boiler is unexpectedly equipped with a full size, mahogany 1905 snooker table. 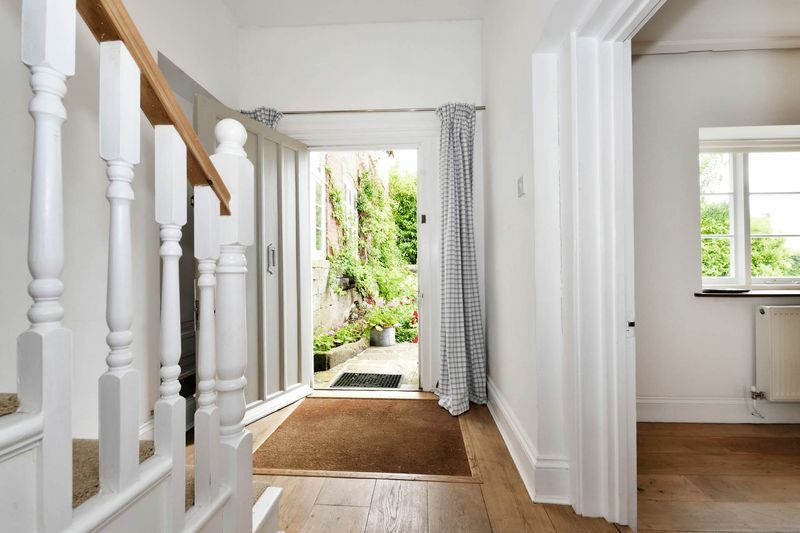 Middle House Entrance Hall – The original Front Door opens into a wide Hallway with wood flooring, to the far end an Under-stairs Cupboard offers great storage beside a half-glazed door opening into the gardens. 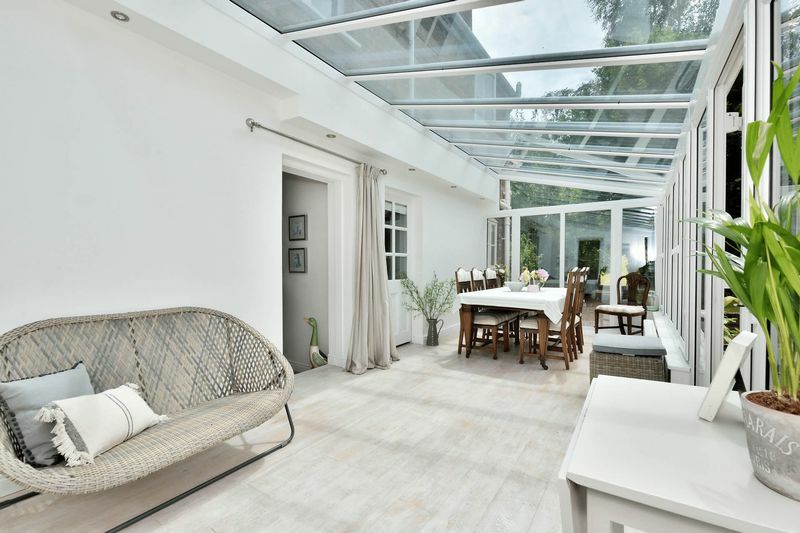 Sitting Room – Enjoying a flood of natural light from its dual aspect, twin large original windows overlook the Courtyard while both a window and a French door have views and access into the gardens. 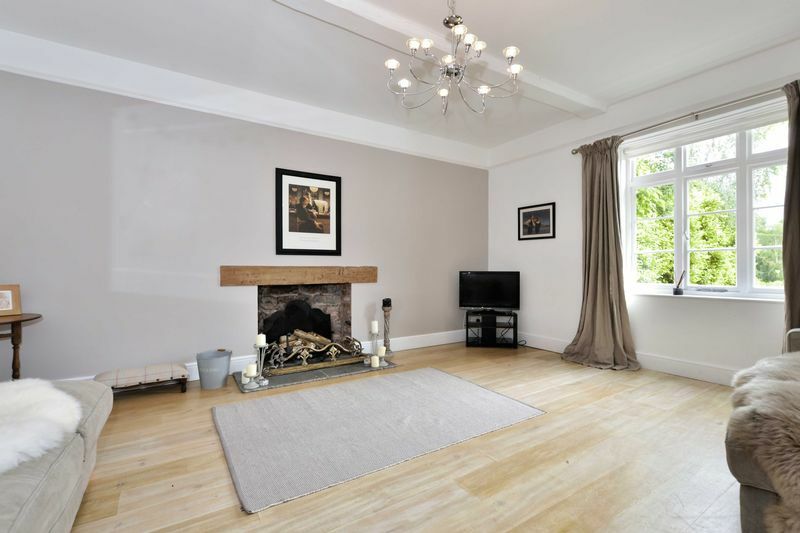 The spacious and stylish Sitting Room has wood flooring, white painted beams and recessed lighting, with a large Woodburner set in an impressive fireplace with timber beam lintel and slate tile hearth. 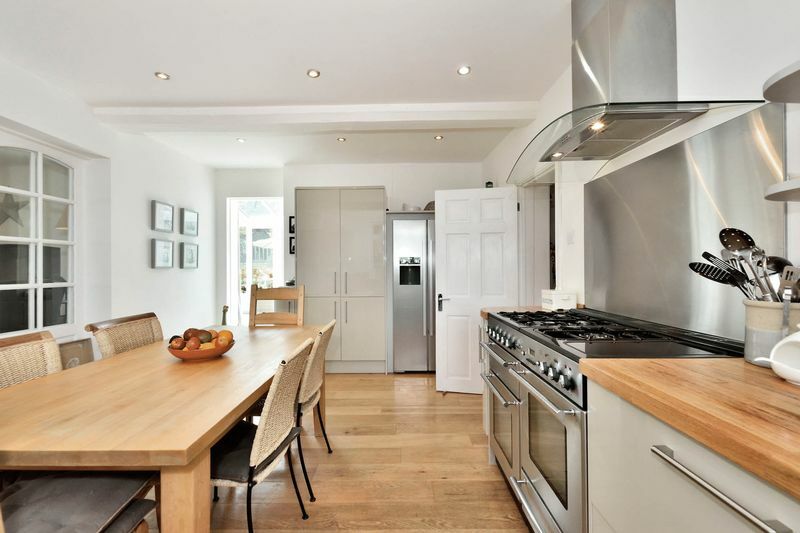 Kitchen/Diner – The Kitchen with ample space for family dining table, is fully-fitted in white units with bleached wood countertops and high open display shelves. 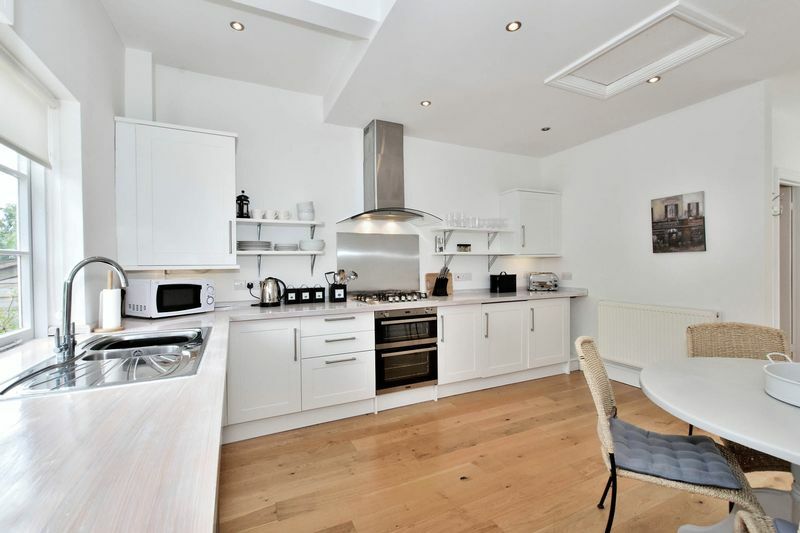 Featured are double oven with 5 burner gas hob and hood above, while integrated are under-counter fridge, freezer and dishwasher. 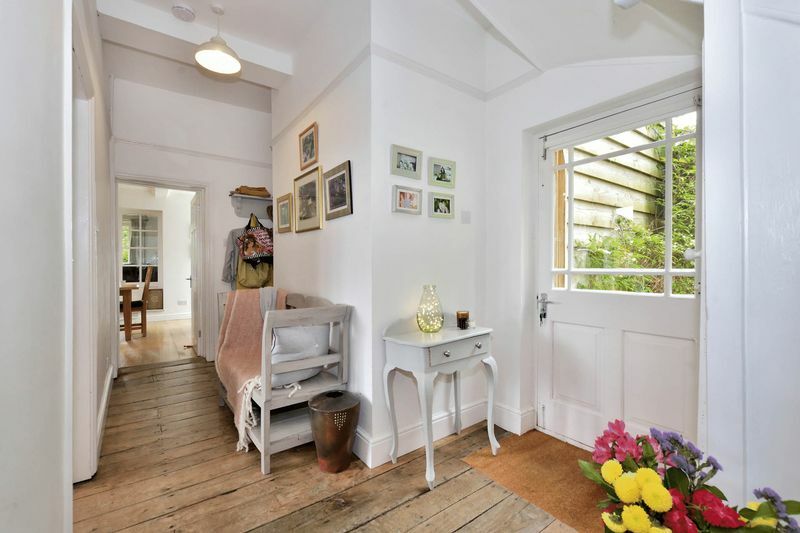 Beyond one of twin doors leading back into the Sitting Room, lies an External half-glazed door opening onto a gravel patio ideal for Outdoor Dining bordered with planted brick edged beds. 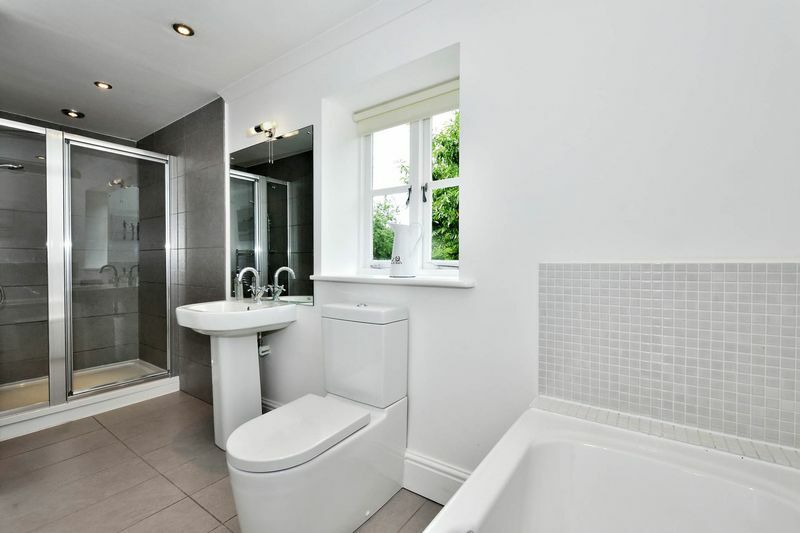 While to the side lies the spacious Downstairs WC. 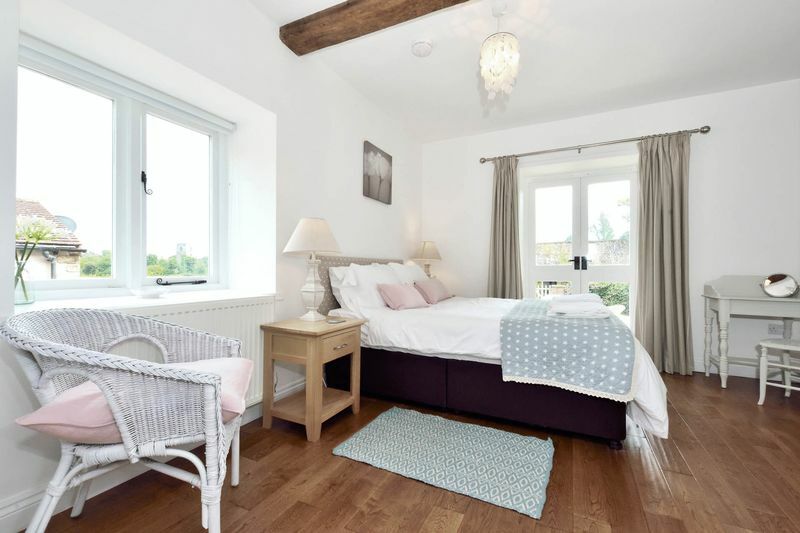 Family Bedroom – The expansive and carpeted Double Bedroom has ample space for an additional single bed creating a highly attractive Holiday Let Family Room and enjoys dual aspect windows. 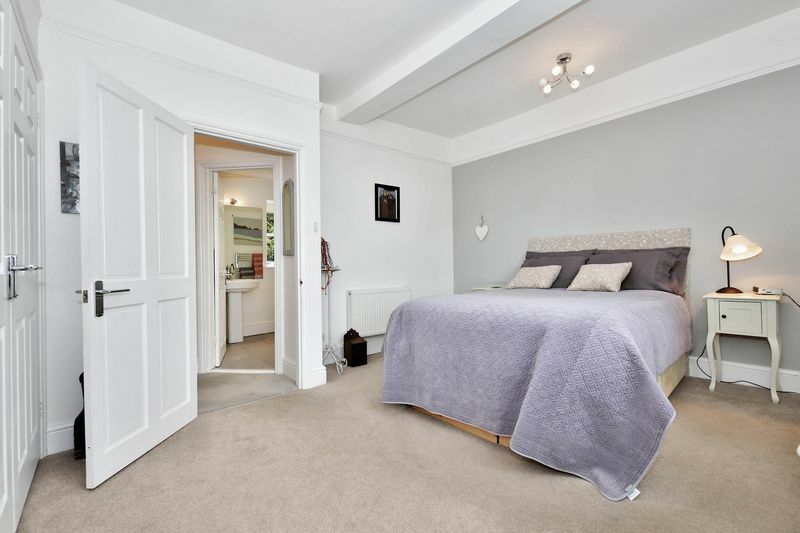 Double Bedroom – The second Double Bedroom features a built-in double wardrobe and overlooks the Courtyard. 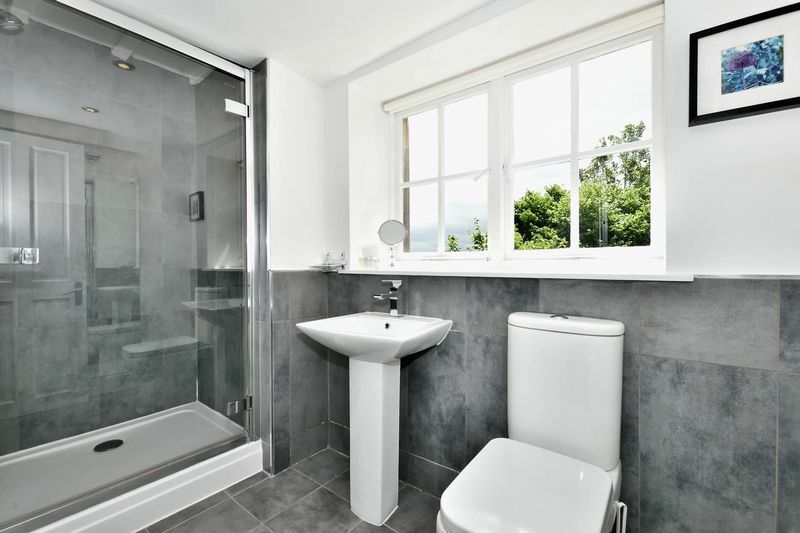 Shower Room – The stylish modern room is completed with large walk-in shower cubicle, WC, pedestal basin and chrome heated towel rail. 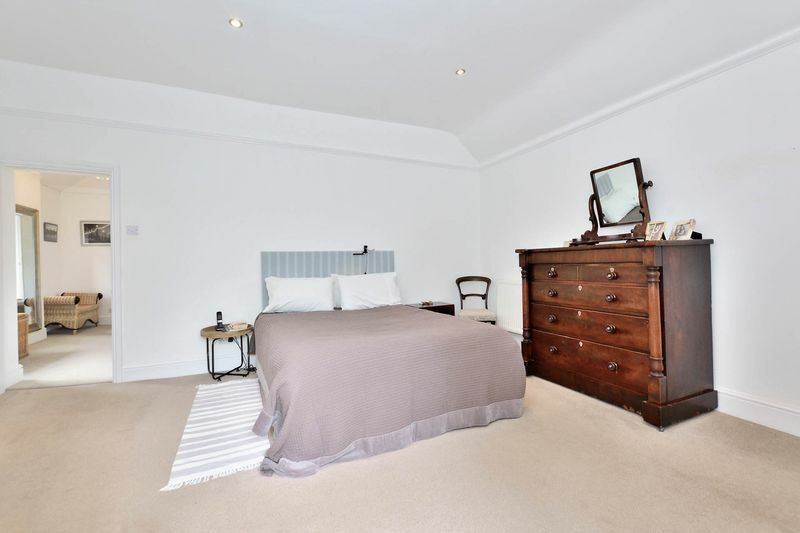 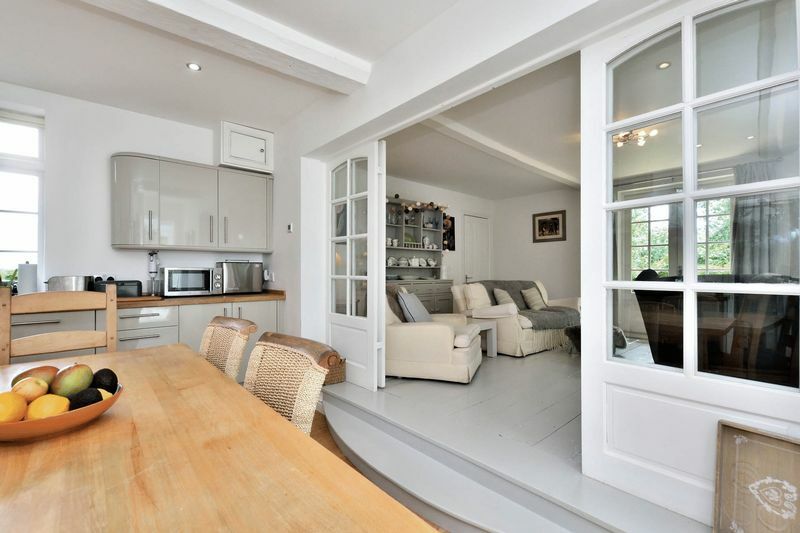 The lovely apartments are immaculately presented, with subject to negotiation the stylish furnishings being retained. 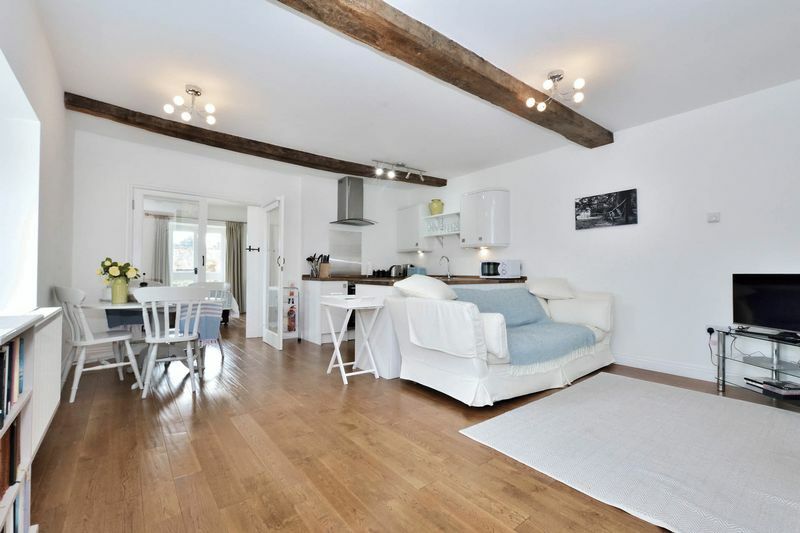 Accessed from a communal Entry Hall with fitted units concealing space for a washing machine, both apartments share rich-hued wood flooring, exposed beams and electric underfloor heating in the Shower or Bathroom. 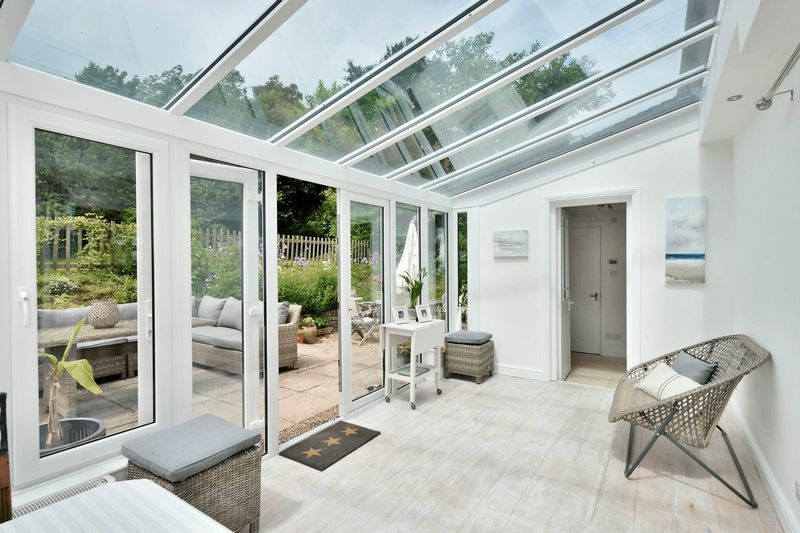 The Kitchens have integrated under-counter fridges while the Double Bedrooms with built-in double wardrobes, benefit from French Doors leading out either onto a balcony or into the private fenced gravel garden. 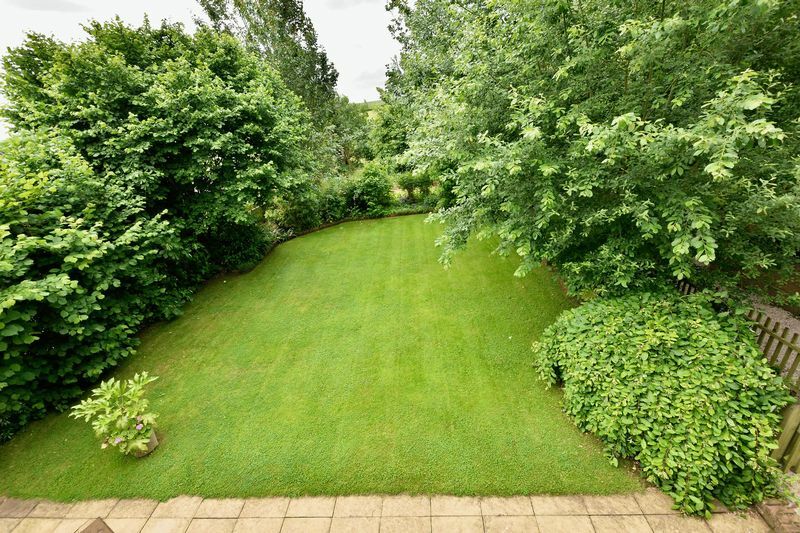 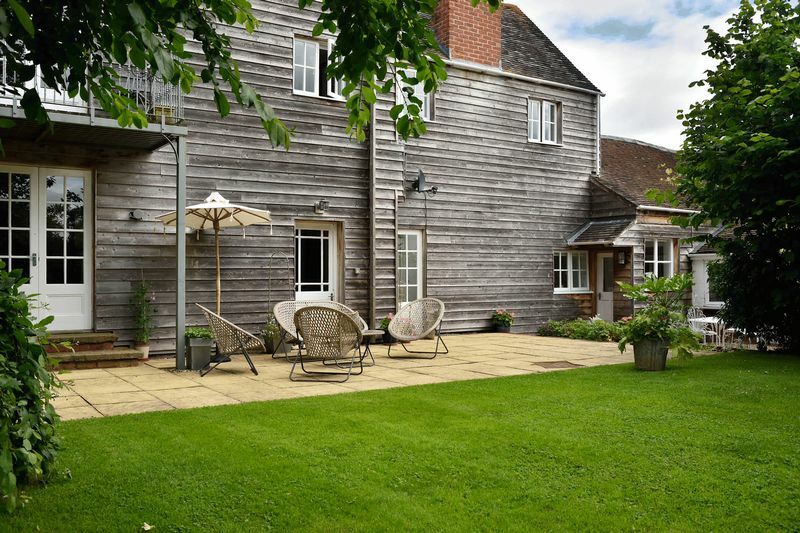 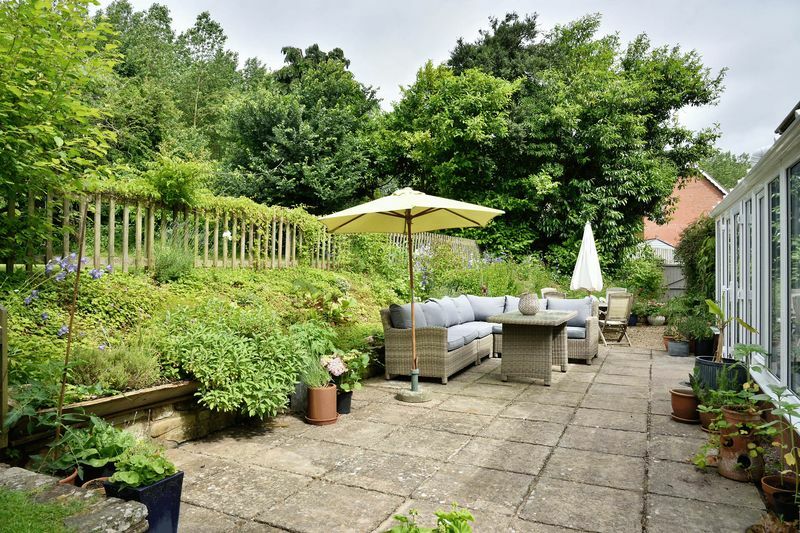 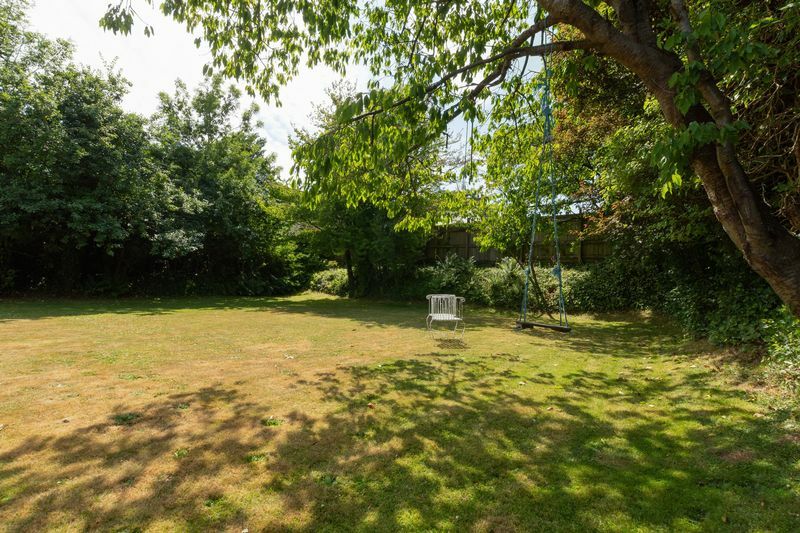 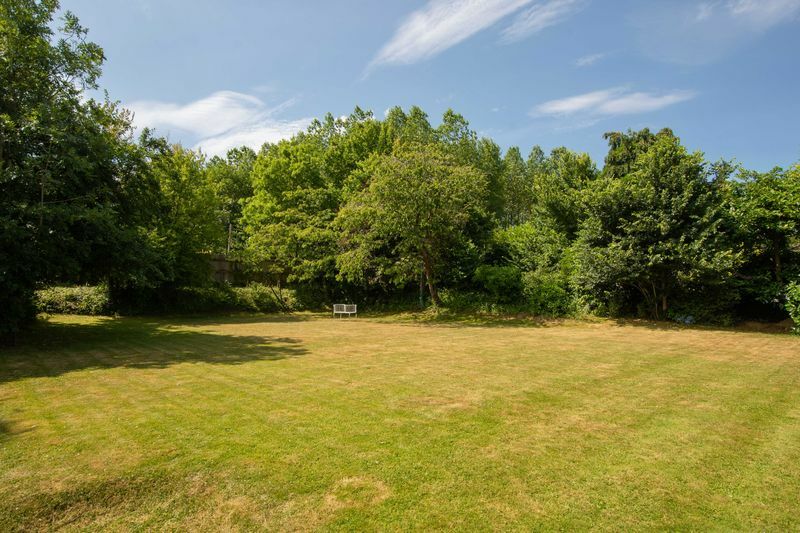 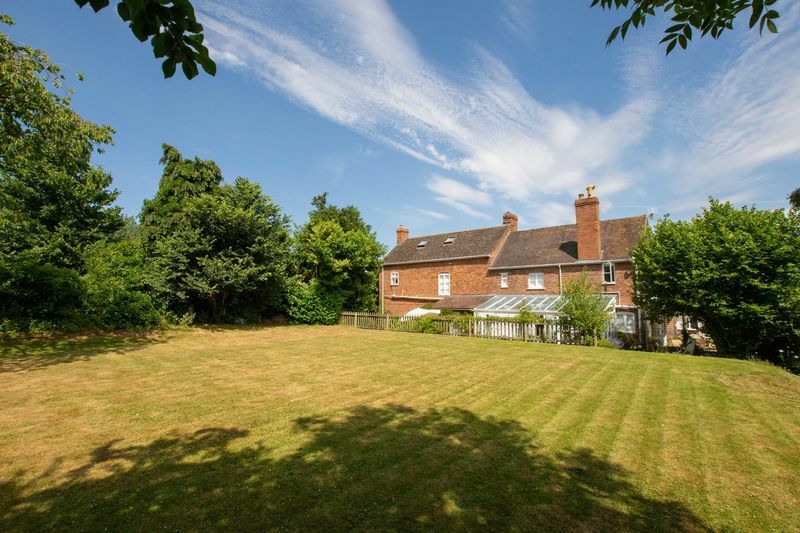 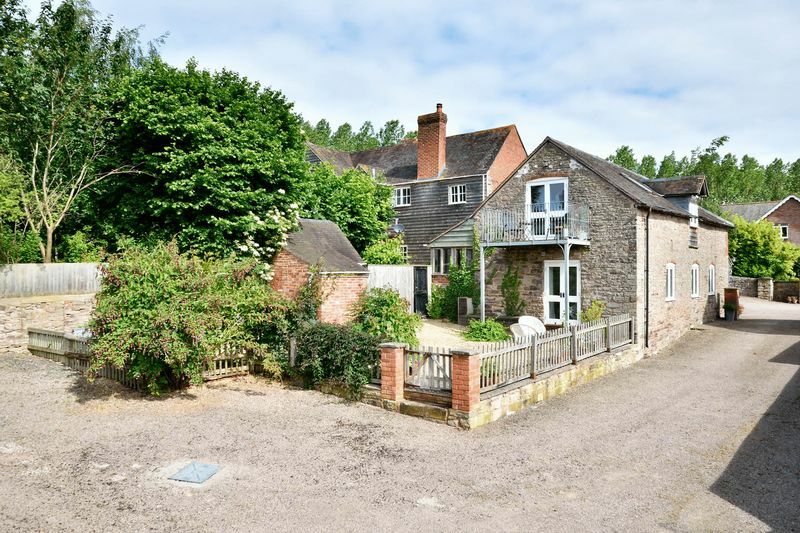 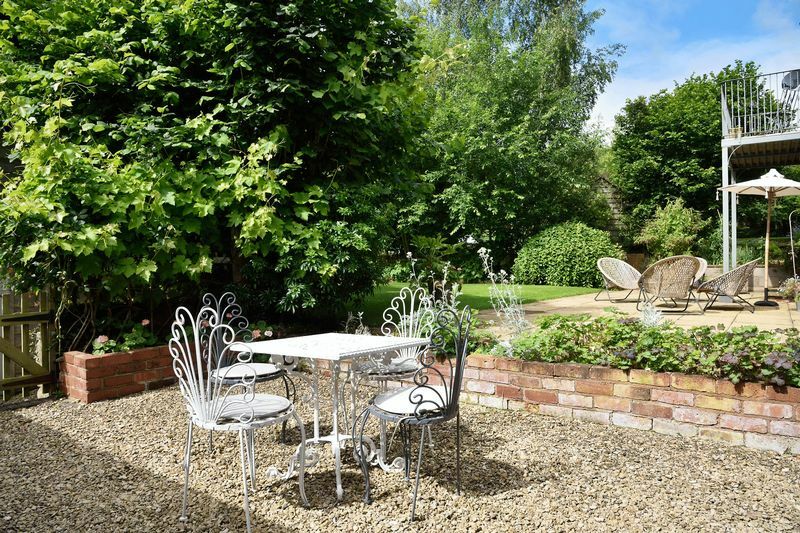 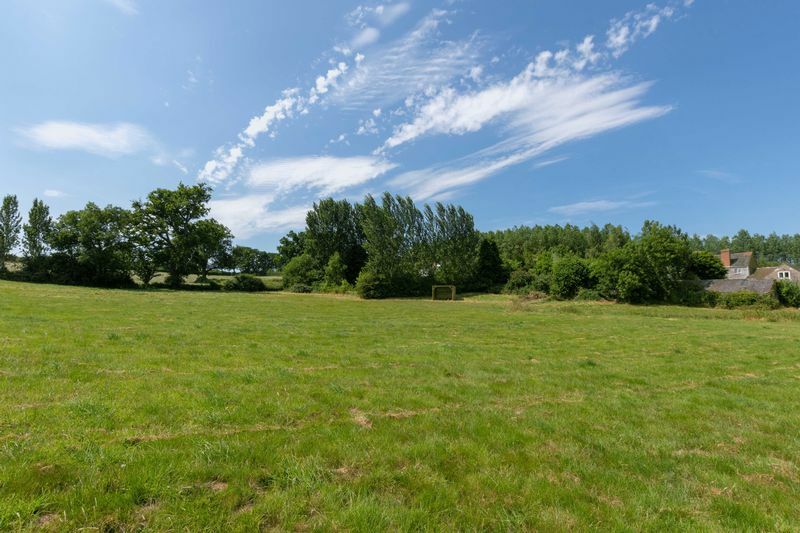 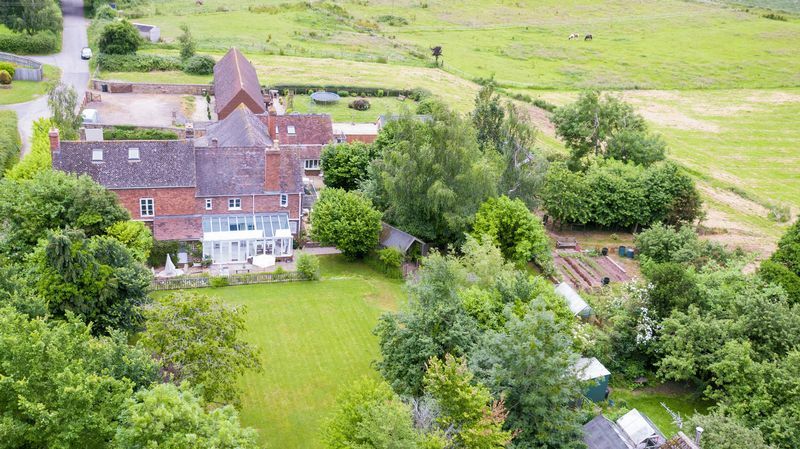 Beyond the lushly-planted, mature gardens lie the Cowshed usefully enjoying both direct driveway access and planning permission for conversion into a fourth Holiday Let (SW1999/3209/F). 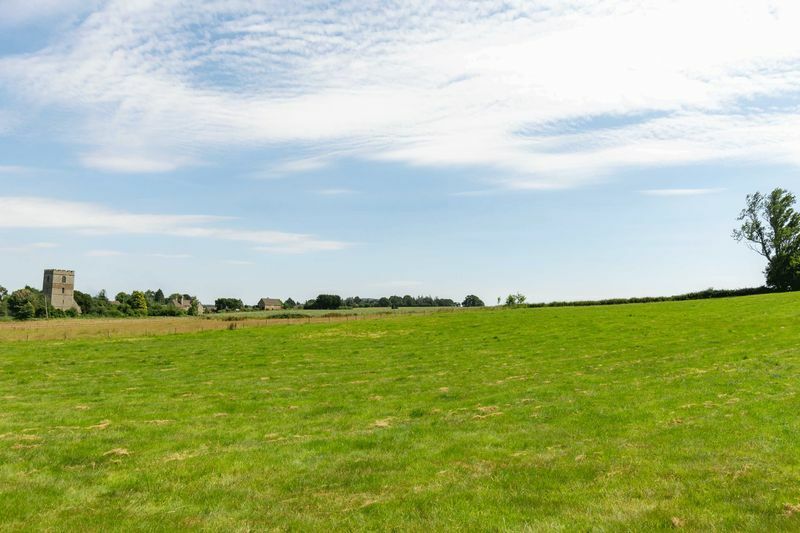 Yet with open pasture of 4.58 acres unfurling beyond, it may also be ripe for development into a modern Stabling block. 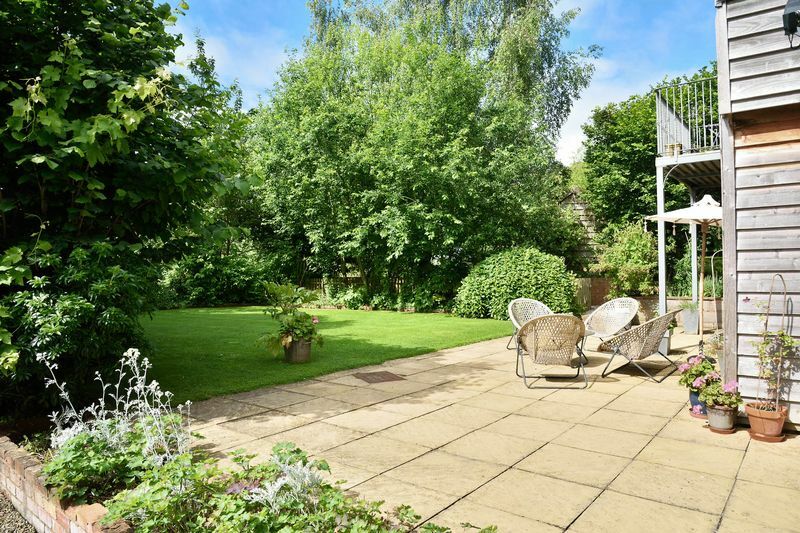 Within the gardens are offered a traditional Potting Shed with 2 tile-roof storage Sheds nearby. 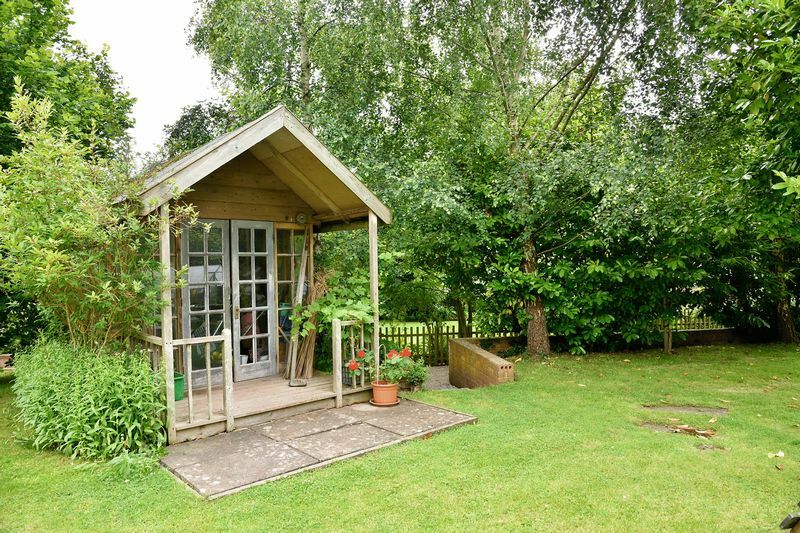 While beyond the Summerhouse opens the productive garden with Greenhouse, vegetable and fruit beds. 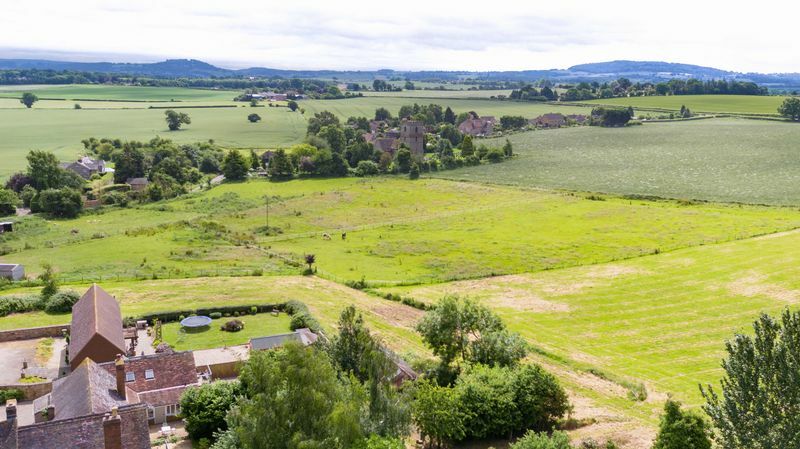 From Hereford take the A465 towards Abergavenny. 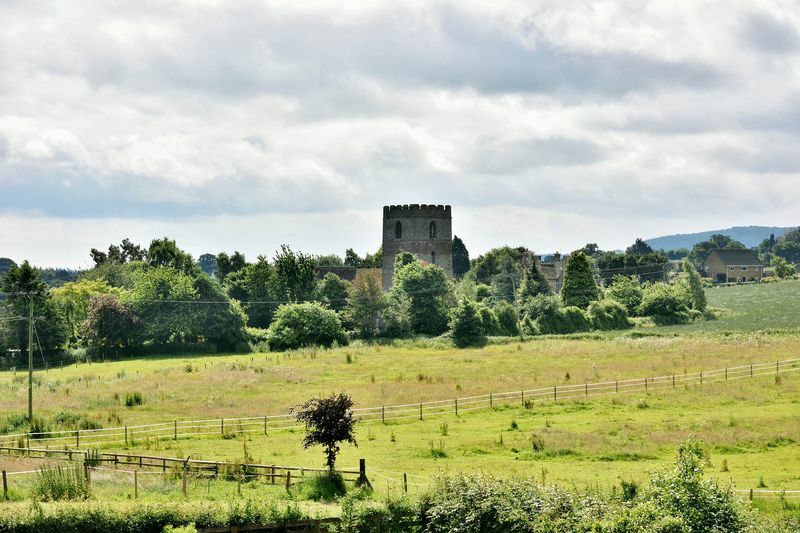 Turn right onto the B4352 for Hay-On-Wye just past Belmont Abbey. 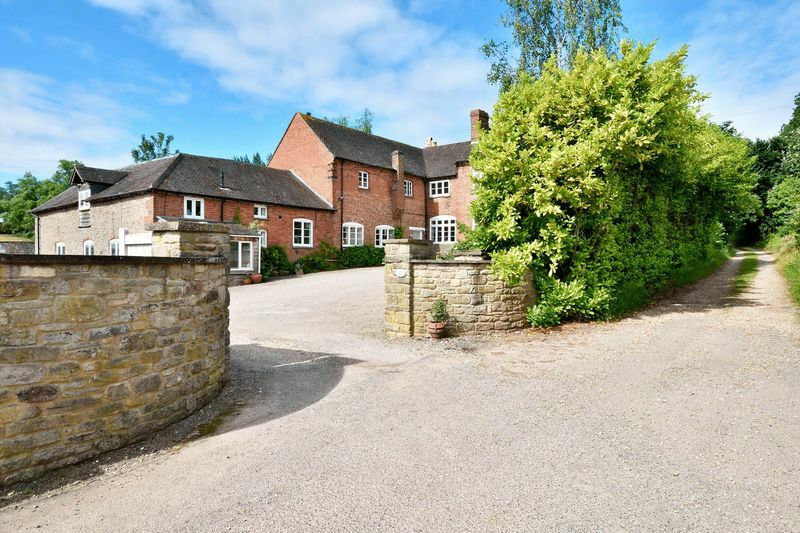 Take the first right turn signed for Ruckhall onto Church Road. 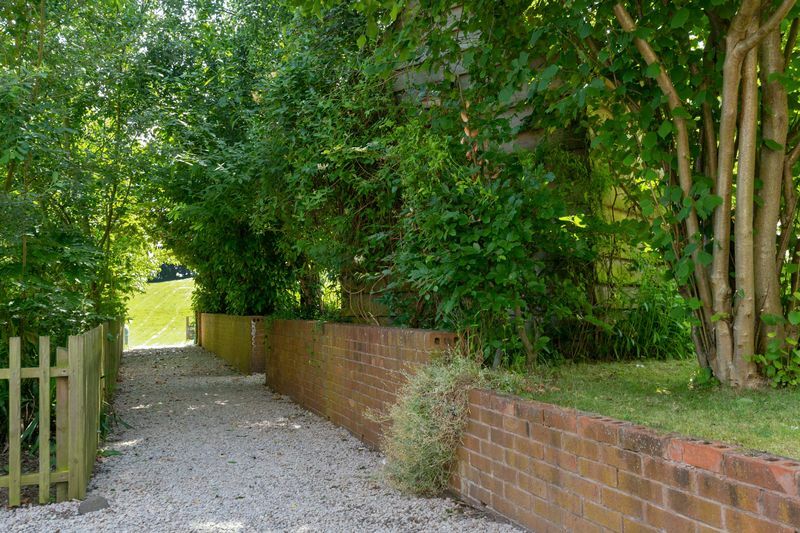 Turn first left after Clehonger village church, the property is to be found on the left immediately ahead.